Thanksgiving and Christmas are right around the corner! I know, I know, I’m not sure that I’m ready to hear that either, but I love making handmade gifts, and every year I think if I just get started sooner, I won’t be sewing until 1 a.m. on December 25th! Maybe I’ll actually start early this year? At least I can help you start early! This tutorial is one that I shared at Skip to My Lou last year for the Holiday Bake, Craft and Sew-along, but I just finished putting the whole thing together for you in PDF form to make it easy to download, print and sew! 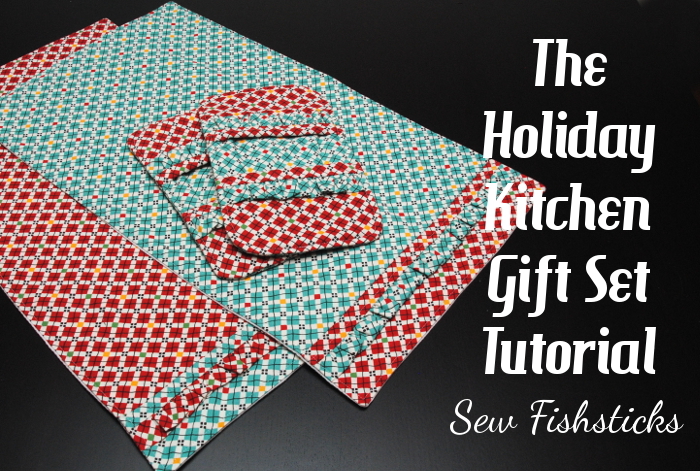 To download the tutorial, just click here: Holiday Kitchen Gift Set. Be sure to save the file to your computer before you print the pattern. Are you looking for the perfect thank-you gift for all of those holiday party hostesses? The Kitchen Gift Set might be just what you need! 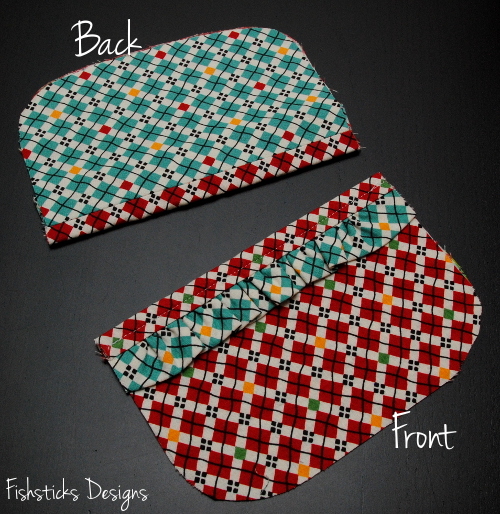 The set includes fold-over, oven-mitt potholders (my favorite kind) and matching dishtowels. 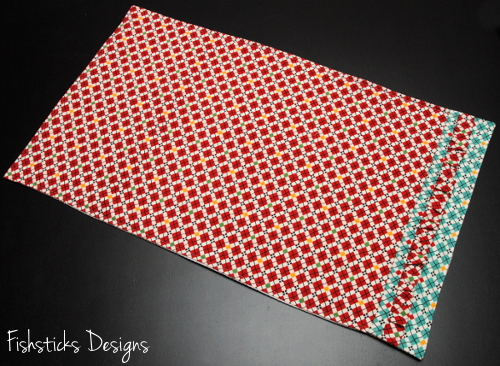 You’ll be able to get two matching potholders and two coordinating dish towels from one yard each of two coordinating cotton prints. 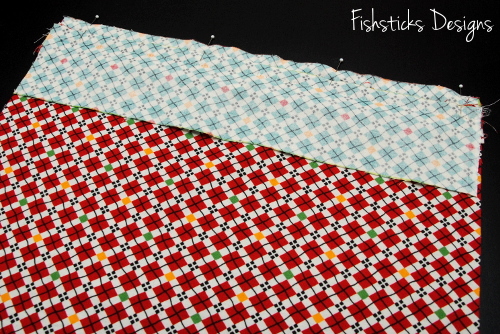 You’ll also need 1/4 yard of Insul-Bright or another insulating fleece for the potholders and 1 yard of absorbent cotton fabric for the backing of the dishtowels (diaper fabric, waffle weave, pique, huck toweling, etc.) 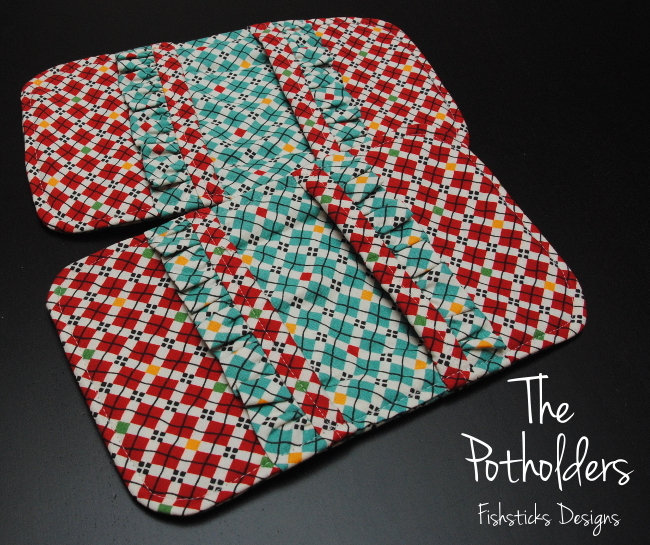 Let’s start with the potholders! 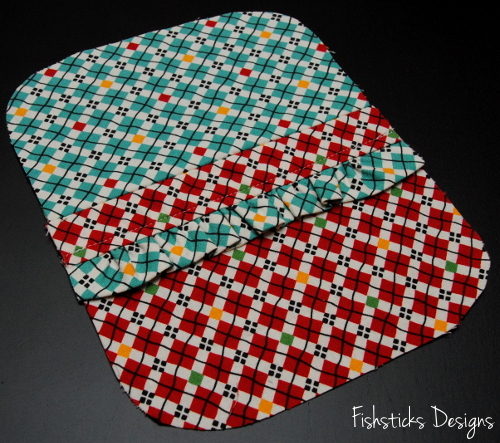 You’ll need the pattern pieces found here: Potholder Pattern Pieces. (Be sure to print that “actual size” and check the measurement of the 2 1/2″ square.) Cut out all of your pieces. 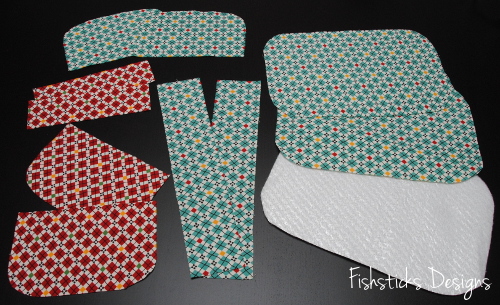 For each potholder, you’ll cut 2 pocket pieces of Fabric A, 2 pocket pieces of Fabric B, 2 base pieces of Fabric B, 2 base pieces of Insul-Bright, 2 trim pieces – 7″ x 2″, and 2 ruffle pieces – 12″ x 2 1/2″. 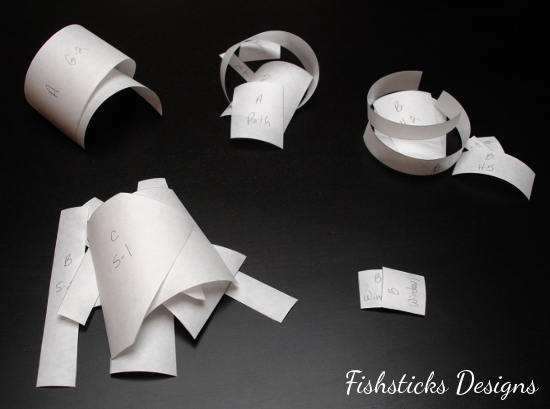 Fold each of your ruffle pieces over with the wrong sides together and match up the long edges. Press well. Sew two rows of basting stitches (the longest stitching your machine allows) along the long raw edges — one at 1/8” and one at 1/4”—leaving the threads on each end 2 to 3 inches long. 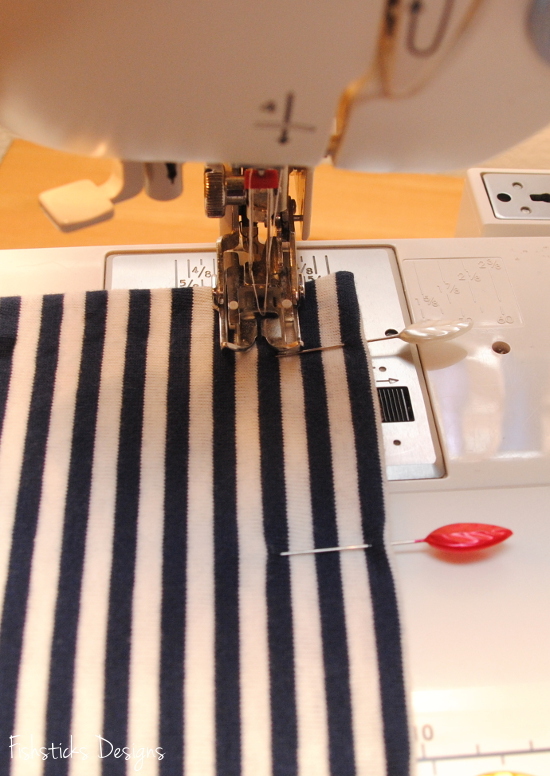 Pull the bobbin threads from each end to gather each ruffle until it is the same length as the trim piece. Place one of the Fabric A pocket pieces on top so that the right sides of the trim piece and the pocket piece are together and the ruffle is sandwiched between. Line up the edges as shown and pin in place. 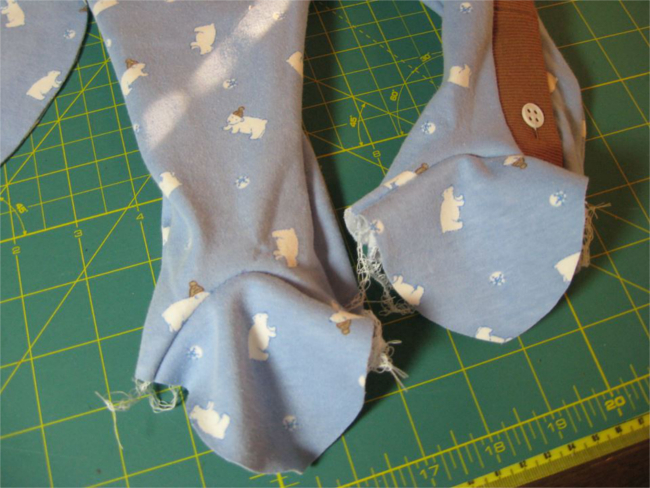 Flip the pieces to the right side and press the ruffle towards the curved edge of the pocket piece while pressing the seam allowance in the opposite direction. Topstitch 1/4″ from the top edge of the ruffle. If you find that you have small spots on each side where the ruffle sticks out. Just flip the pocket piece over and trim those off. Pin the long edge of one Fabric B pocket piece to the remaining raw edge of the trim piece with the right sides together. Sew the pinned edge. Flip the pieces apart and press the seam allowance toward the ruffle. 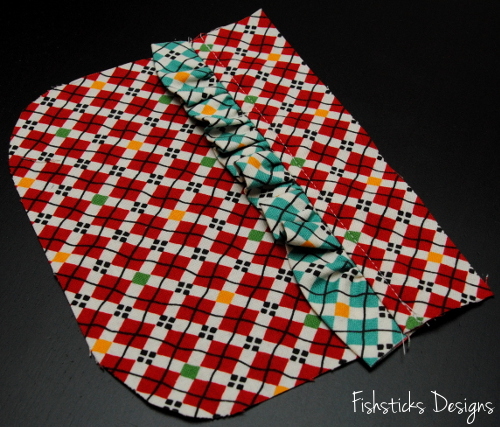 Fold the pocket over so that the wrong sides are together and the curved edges are all lined up. Press well. 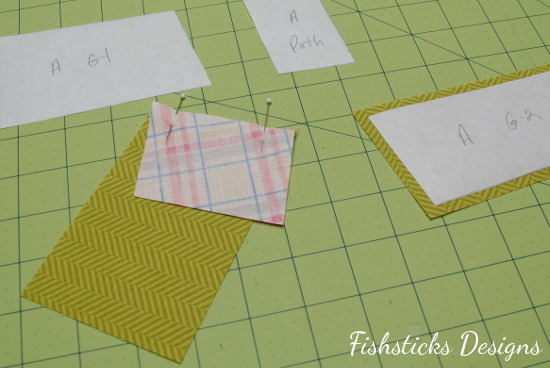 Follow the same steps to assemble the remaining pocket. Set your pocket pieces aside for now. 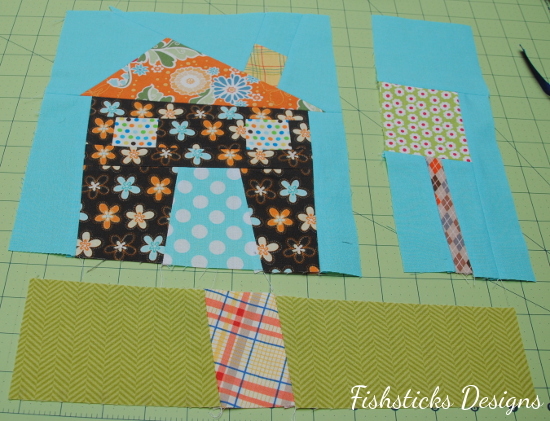 Take one of your base pieces and draw a quilting grid on the right side of it. I used one of my Frixion pens to do this, but you can use a washable or disappearing marker, as well. I placed my lines 1 3/4″ apart, starting from the center in each direction. Pin this piece on top of the two layers of Insul-Bright. 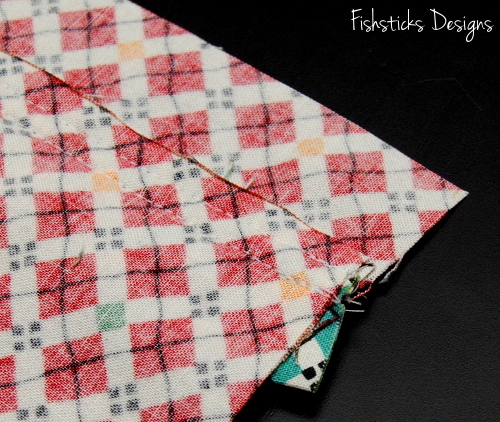 Place your finished pocket pieces on top of the remaining base piece, lining up the curved edges as shown. 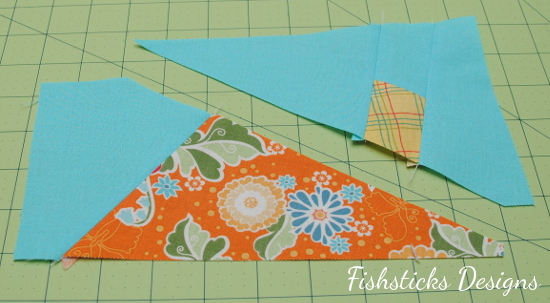 Flip the quilted base piece/Insul-bright over on top of these so that the right sides are together and the pocket pieces are sandwiched between. Pin in place. Stitch all the way around, leaving an opening for turning in one short end. Clip or trim the curves before turning right side out. Turn through the opening and push the corners out neatly. Tuck the raw edges of the opening in and press well. Pin the opening closed. Topstitch all the way around at 1/4″. (In addition to using your walking foot for this step, a denim needle will help to prevent skipped stitches when going over the thick areas.) 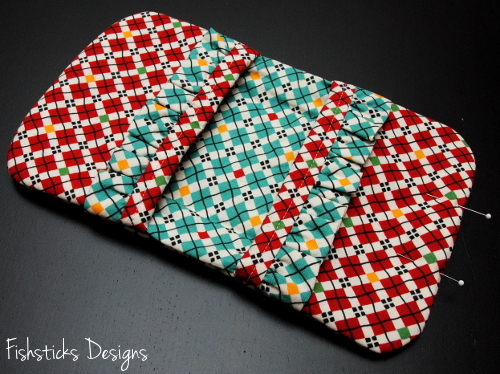 Your first potholder is done! Now you just need to make it a mate. Let’s move on to the dish towels! Start by cutting out your pieces. You’ll need a layer or two of absorbent fabric. (I’m using two layers of diaper cloth from Joanns. Be sure to wash and dry all of your fabrics before getting started!) 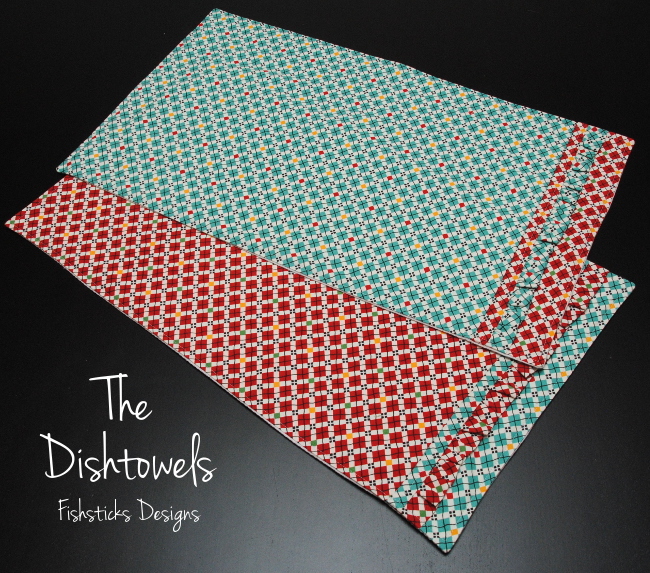 For each dishtowel, you’ll cut these pieces: 1 or 2 layers of absorbent fabric – 23 1/4″ x 14″ (if you cut two layers, you’ll treat them as one from here on), 1 Fabric A main piece – 21″ x 14″, 1 Fabric A ruffle piece – 22″ x 2 1/2″, 1 Fabric B large trim piece – 3″ x 14″ and 1 Fabric B small trim piece – 1 1/2″ X 14″. 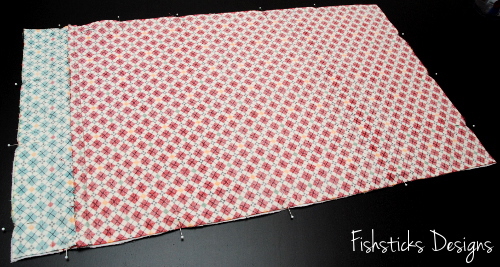 Follow the same steps that you used for the potholders above to create your ruffle. 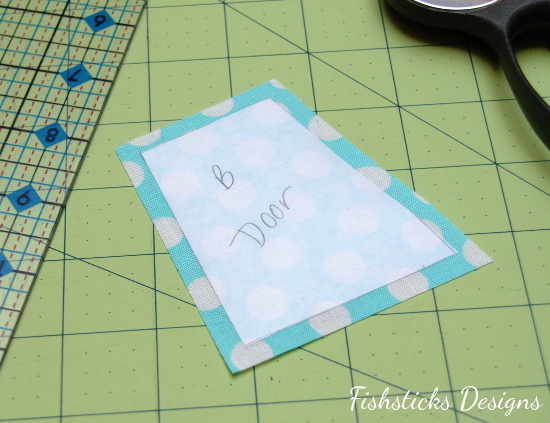 Pin the gathered edge along one long edge of the smaller trim piece on the right side. 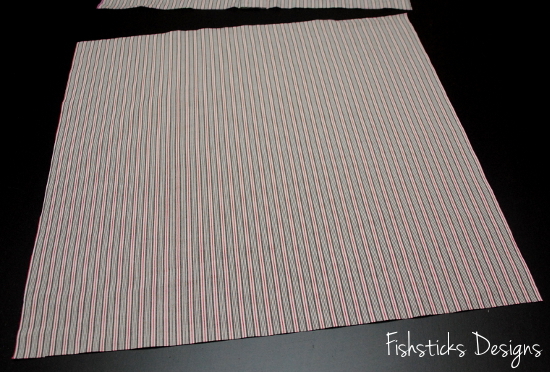 Place the larger trim piece on top so that the right sides are together and the ruffle is sandwiched between. Line up one of the long raw edges of the larger trim piece with the pinned edges of the ruffle and smaller trim piece and pin in place. 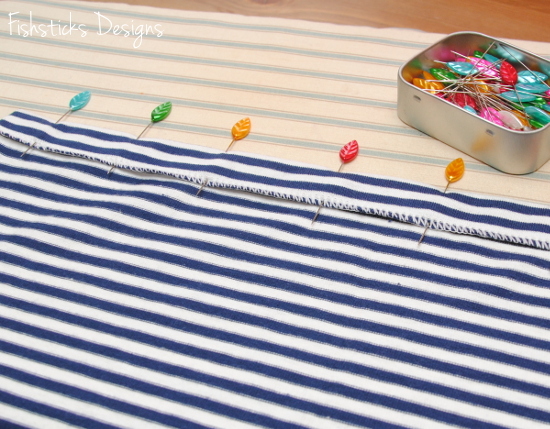 Sew along the pinned edge. Flip the pieces over to the right sides. Press the ruffle towards the larger trim piece with the seam allowance in the opposite direction, but do not topstitch yet. Line up the remaining long raw edge of the smaller trim piece along one short edge of the main towel piece with the right sides together. 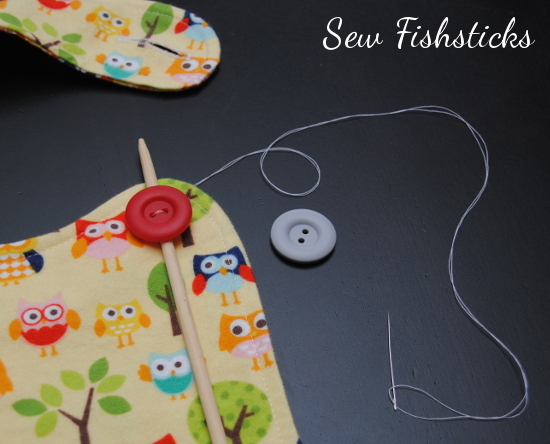 Pin and sew. Flip the pieces apart and turn to the wrong side. 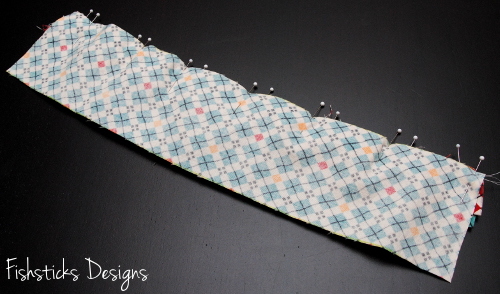 Press this seam allowance over the seam allowance from the ruffle. 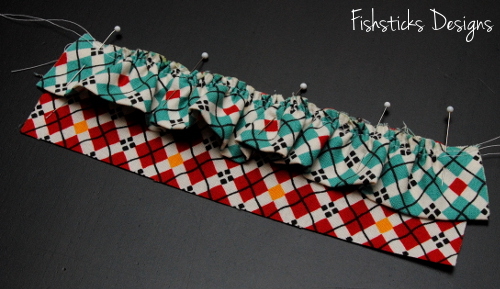 Flip back over to the right side and topstitch 1/4″ from top of the ruffle. 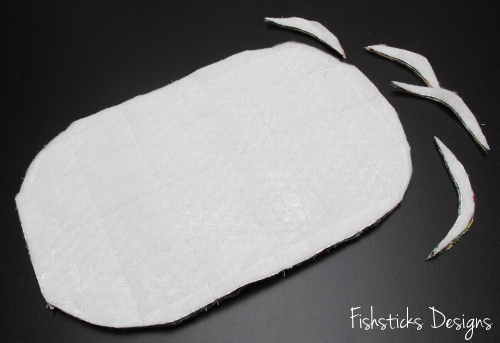 Place the finished top face down on your absorbent layers so that the right sides are facing. Pin. 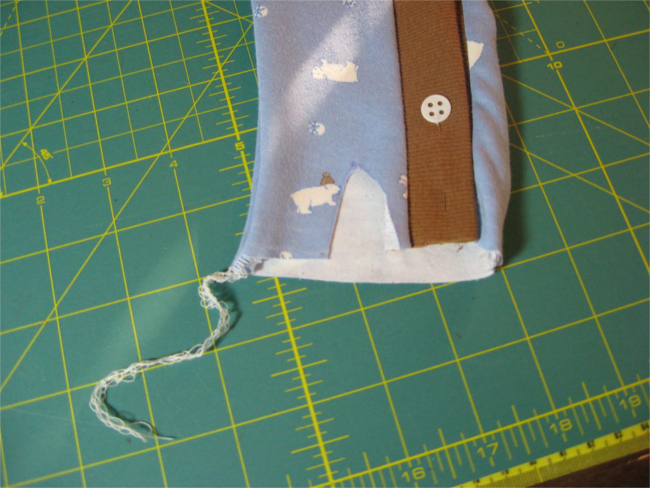 Stitch all the way around, leaving a 4″ opening in one side for turning. Clip the corners. Turn the towel through the opening. Push the corners out neatly and tuck the raw edges of the opening inside. 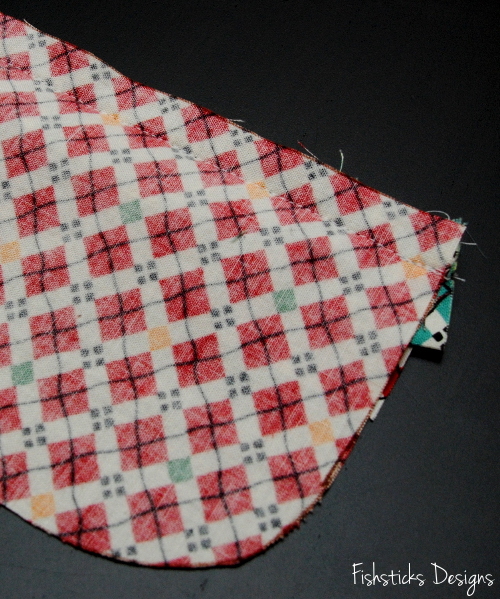 Press well and topstitch all the way around at 1/4″. 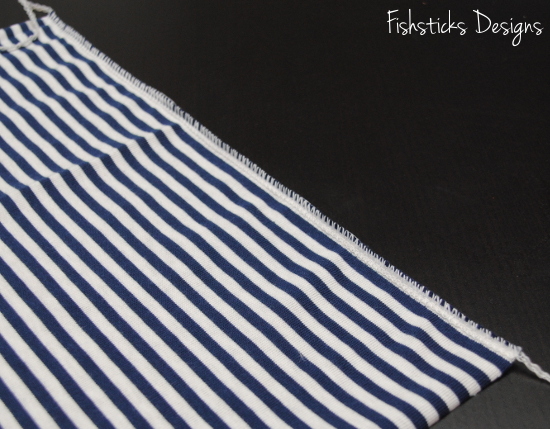 Your dish towel is done! Make a second one if you’d like, and your Kitchen Gift Set will be ready to gift to your favorite hostess! 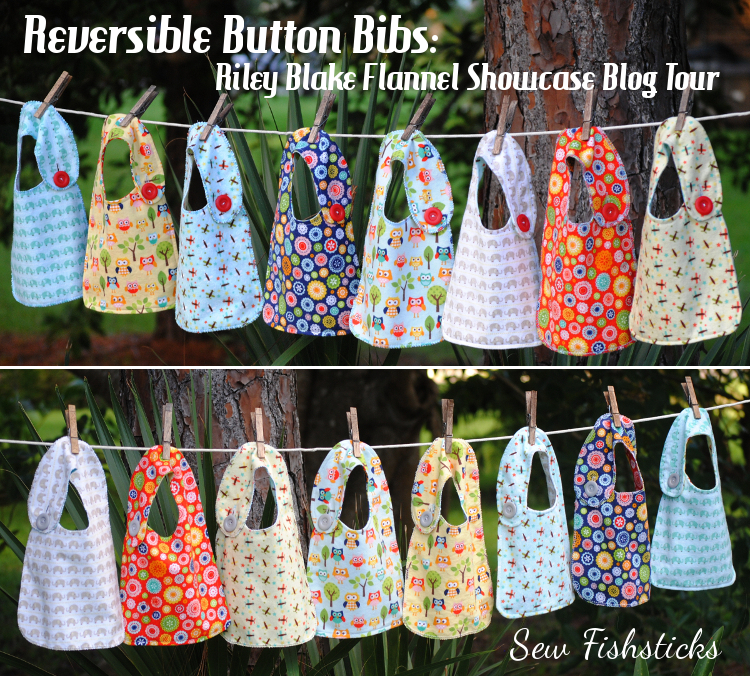 I’m up on the Riley Blake Designs Flannel Showcase Blog Tour! 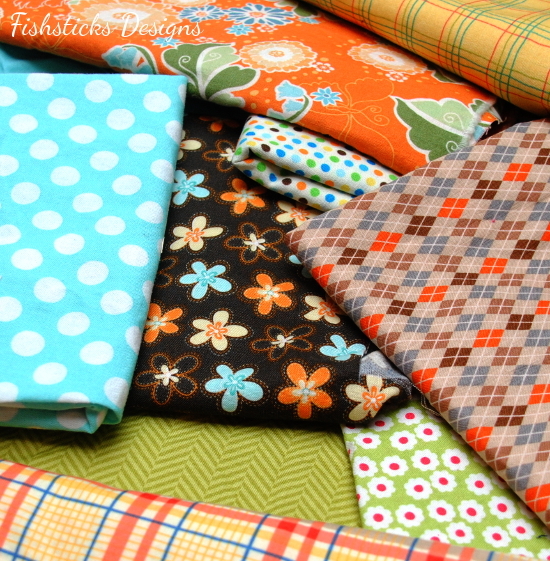 Over the next few months, sewing bloggers will be featuring some of their favorite ways to use flannel fabric in handmades, all using Riley Blake’s great selection of cotton flannel fabrics. 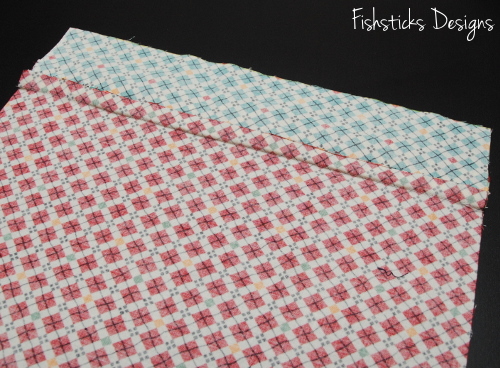 RB’s flannel fabric is a favorite here in our house because it has that wonderful soft brushed feel, and it stays that way wash after wash. Because it’s 100% cotton and thicker than quilting cotton fabrics, flannel is not only soft, but it’s absorbent, too. That makes it a great choice for those sweet and darling but very drool-ly and spit-uppy babies! 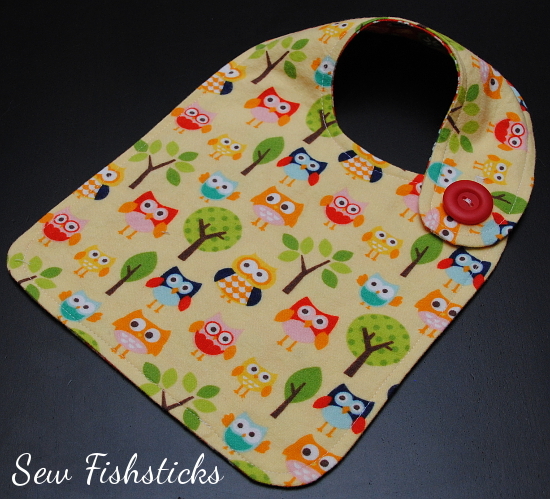 Anyone who has spent time with a newborn knows that a collection of absorbent drool bibs makes life much cleaner and drier. 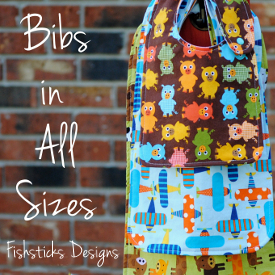 Thankfully, bibs are quick and simple to sew, so you can have a stack done in no time, and making them reversible for two looks in one is just as easy. 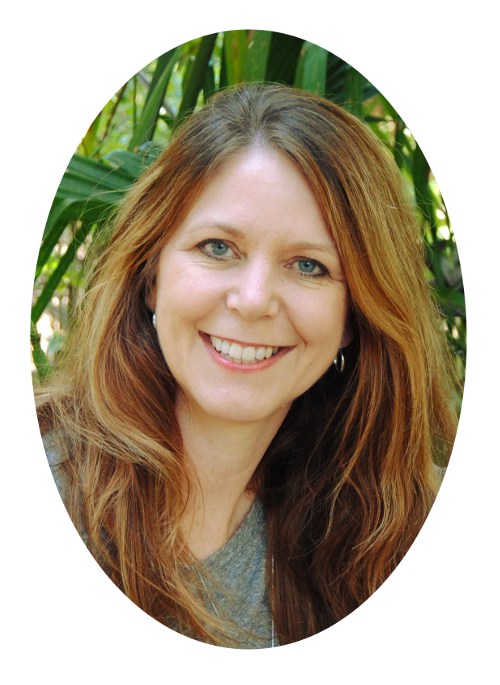 I thought I’d take advantage of the blog tour and show you how! 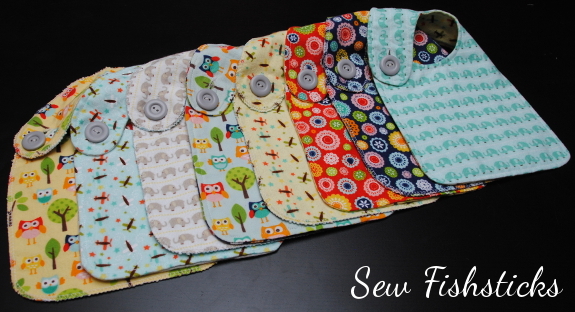 We’re going to start with my free Bibs in All Sizes pattern. 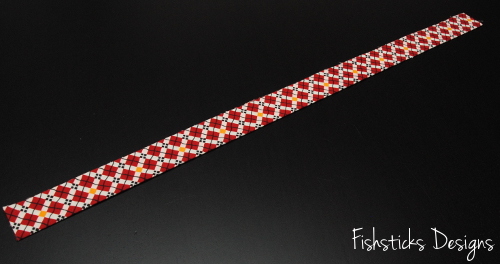 To download the pattern, just click here, scroll down to the red link at the bottom of the post and click again. Be sure to save the file to your computer before printing the pattern. 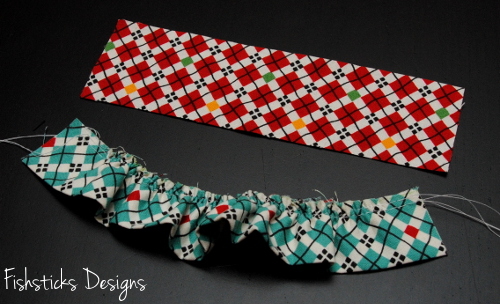 In order to make these reversible, I replaced the waterproof backing with another layer of flannel. If you wanted to make these waterproof, though, you could hide a waterproof fabric inside. 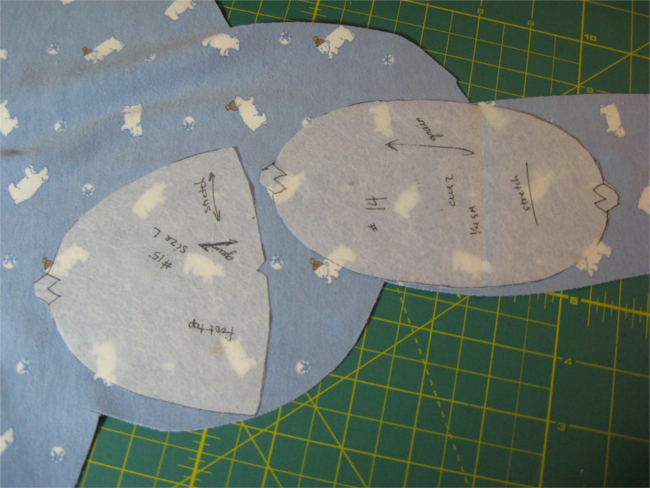 Follow the instructions for cutting out and assembling your bib, either sewing it with your machine or serging it. 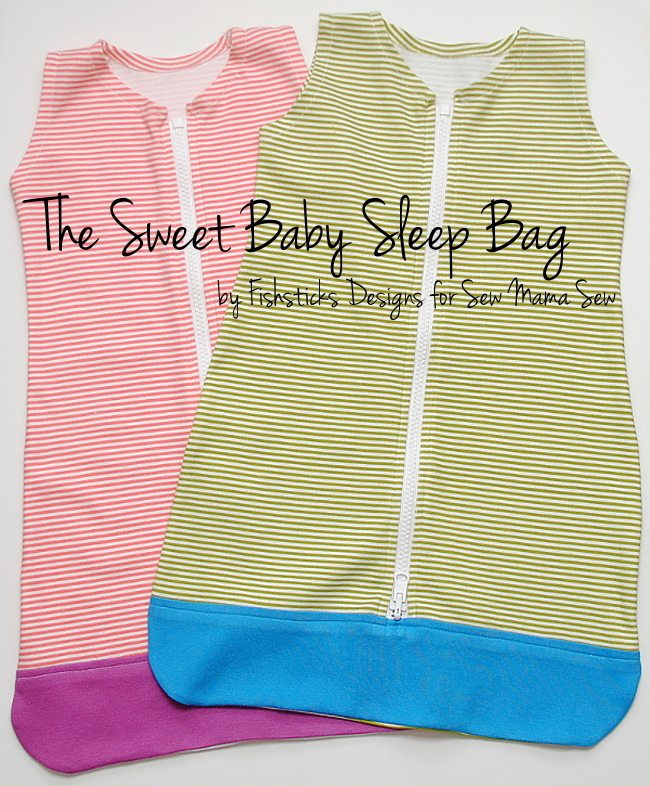 (I’m using the infant size here, but toddler, big kid and adult sizes are all included in the free pattern.) 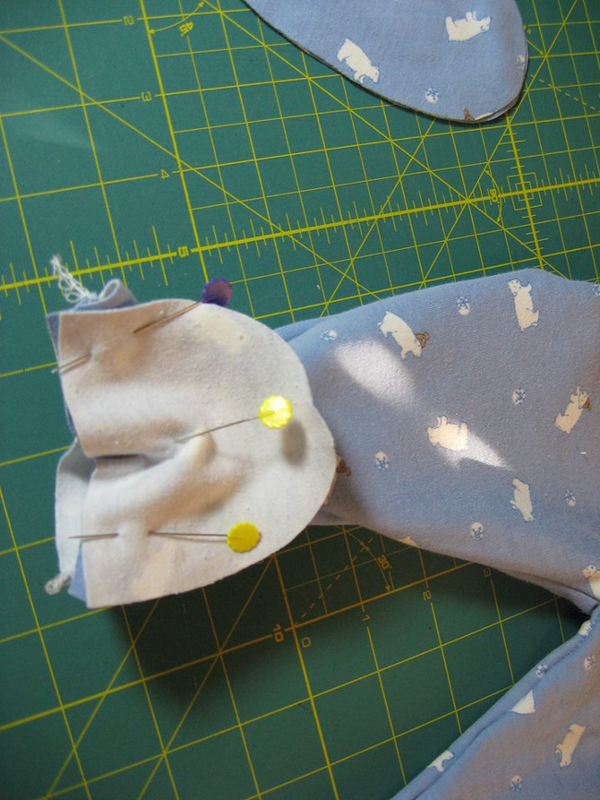 From here, we’ll be adding buttons for fastening rather than the snaps called for in the pattern. 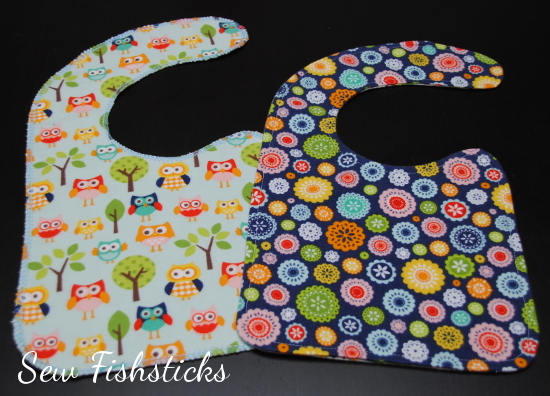 For these bibs, I used Riley Blake’s Matte Finish Buttons in Gray and Red. 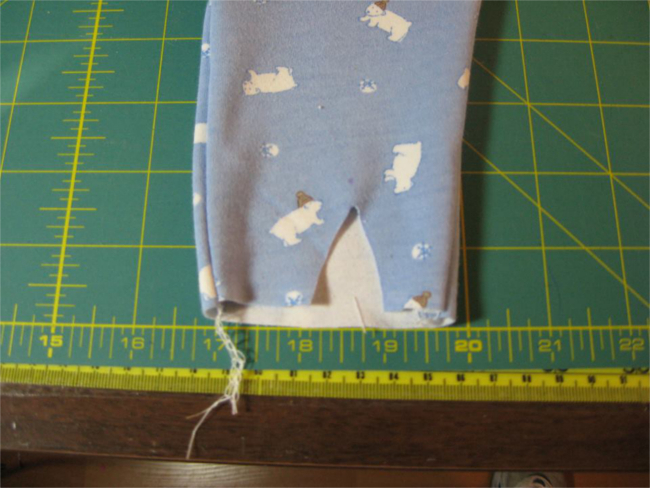 Measure in from the end of the snap strap ½” on the Infant Size (1″- Toddler, 1 ½”- Big Kid Bib) and mark the center point. This will be the beginning of your button hole. 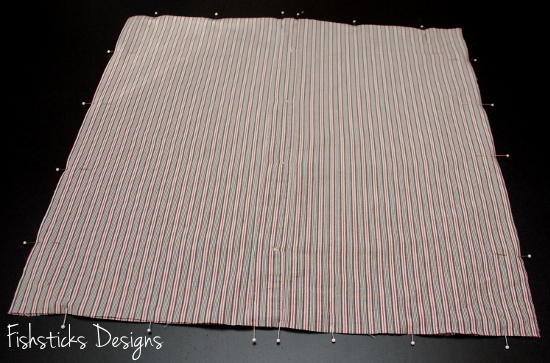 Draw a vertical straight line 1/4″ longer than the width of your button to mark your button hole. Stitch your button hole. (Refer to your machine’s manual for using your automatic button hole attachment.) 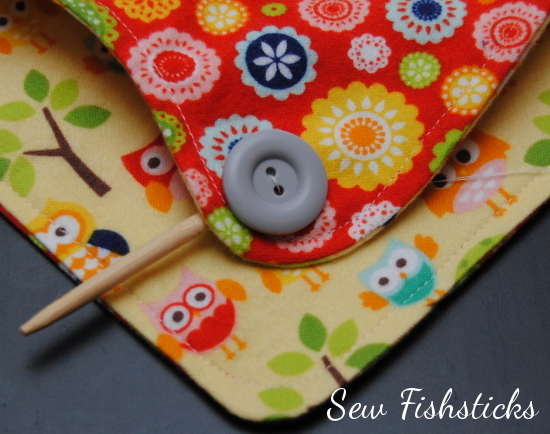 We’re going to sew two buttons back to back so that each side has it’s own button. When you do this, you have to add some space between the buttons to keep them from being too tight. 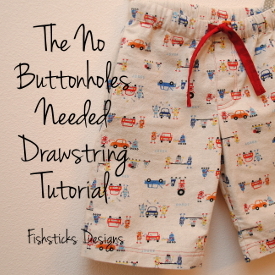 (If you just sewed them back to back without some wiggle room, you wouldn’t be able to pull the buttons through the button hole.) If you have a chopstick (or what I often refer to as a corner-poker-outer) handy, that will work beautifully! 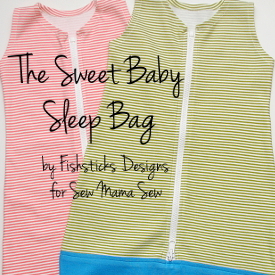 Place the chopstick on the front side of the bib, centered on the little hump where you’ll be sewing your buttons. 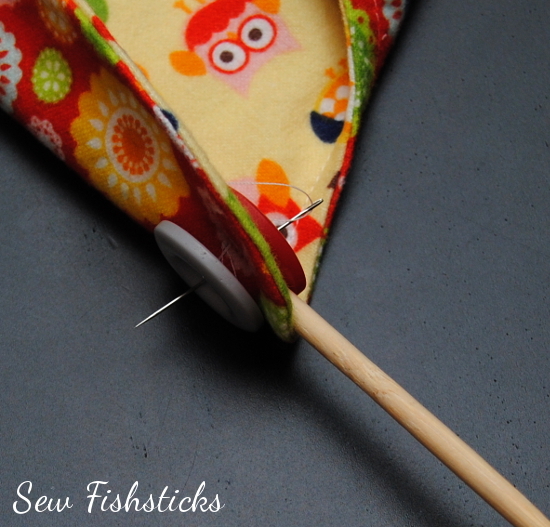 Place the first button on top of the chopstick, just below your topstitching or serger threads. Grab your hand needle and thread, and thread the needle, pulling the thread ends through so that you’ll be stitching with two thread lengths at once. Tie a generously-sized knot in the end of your thread. Pull the thread through from the back into one hole in the button, out the opposite hole and back through to the back of the bib. Be sure that your knot is snug against the back of the bib. 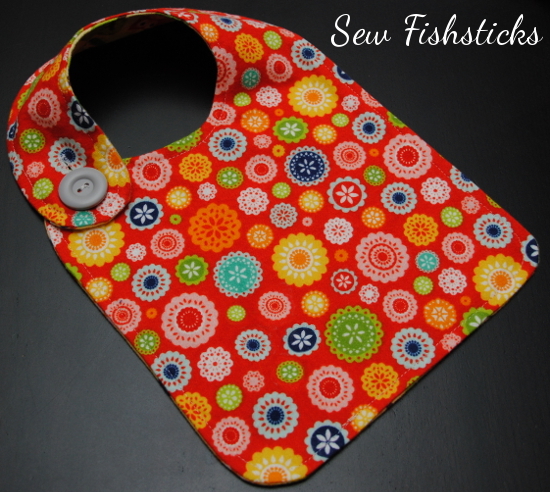 Slide your second button onto the needle and pull it all the way down against the back of the bib, lining it up behind your first button. 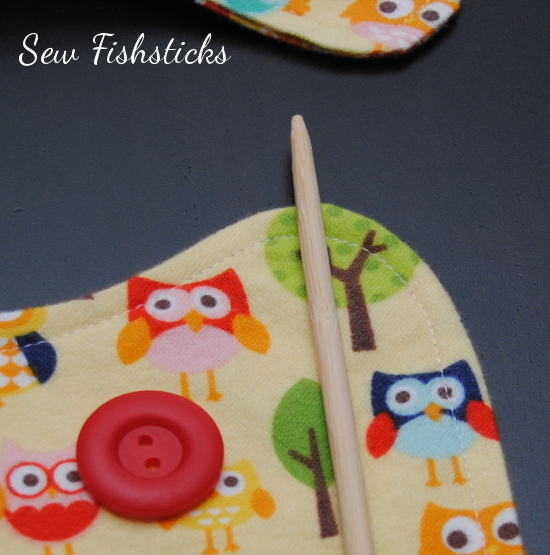 Poke the needle through the opposite hole in the back button and through the matching hole on the front button. 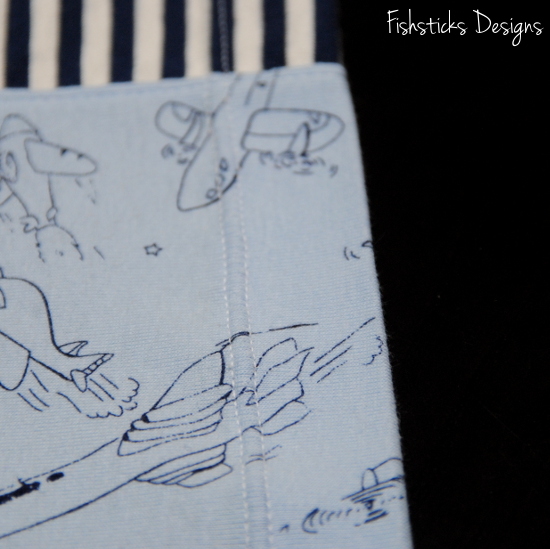 Continue stitching through the two buttons with the chopstick between until your button is well secured. (An important safety note: These buttons must be attached securely and firmly. Be sure to check them regularly. Never ever leave a baby or child alone or sleeping while wearing a bib.) Pull out the chopstick and slide the needle under the threads in the back. Tie a knot around these threads and knot again several times. Trim away the extra thread. 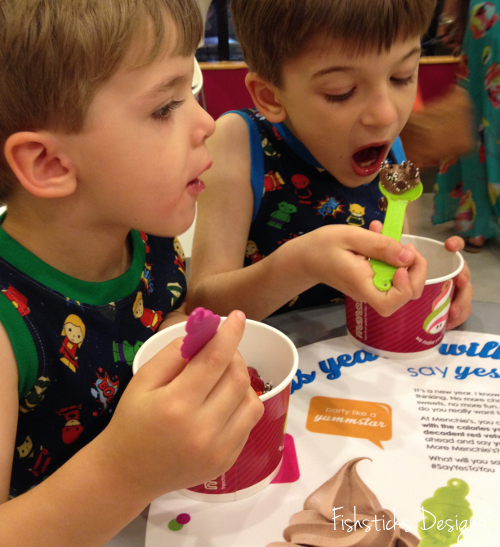 Button your bib on the front side …. …or flip it over and button it on the other side! Mark your calendars and follow along for the next 7 weeks as we re-discover our love of flannel and get inspired by fun new flannel project ideas! 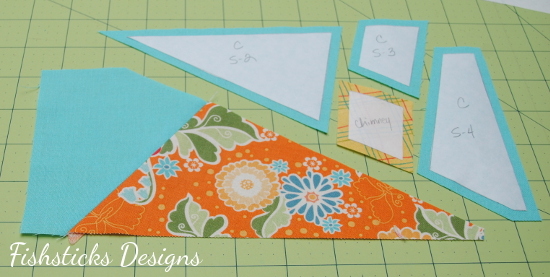 9/26 Simple Simon & Co.
I’ve got a brand new tutorial up at Riley Blake’s Cutting Corners College! 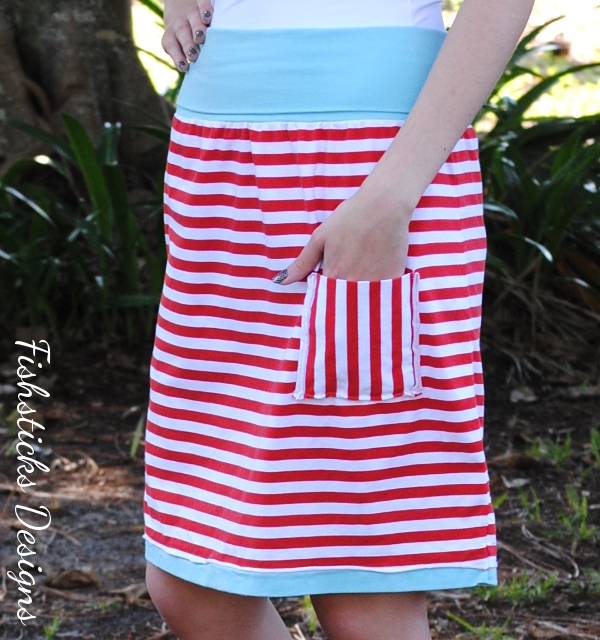 The Casual Straight Skirt is a stylish and comfortable skirt that sews up in no time at all. 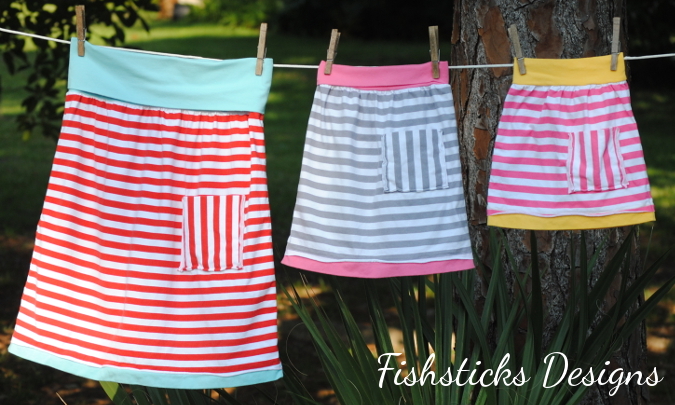 The skirt is made with stretch jersey and takes advantage of those great curling edges in some fun details, and you can make it to fit from toddler to misses with just a few measurements! 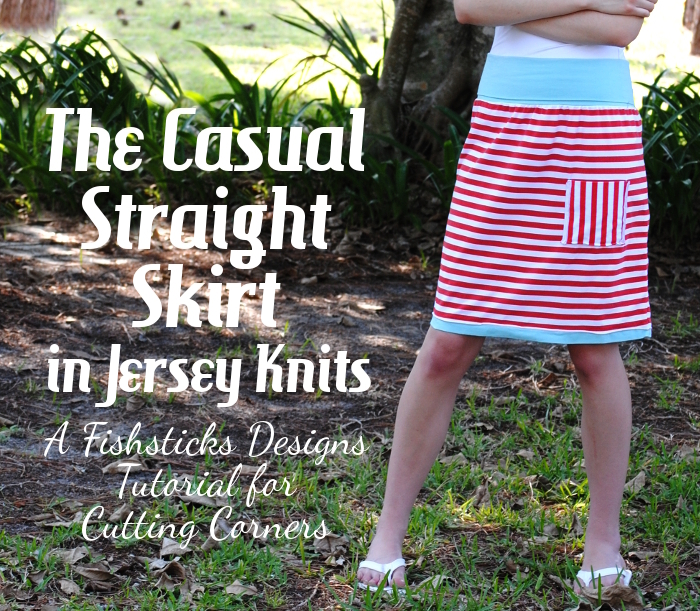 Find the tutorial right here: The Casual Straight Skirt in Jersey Knits. 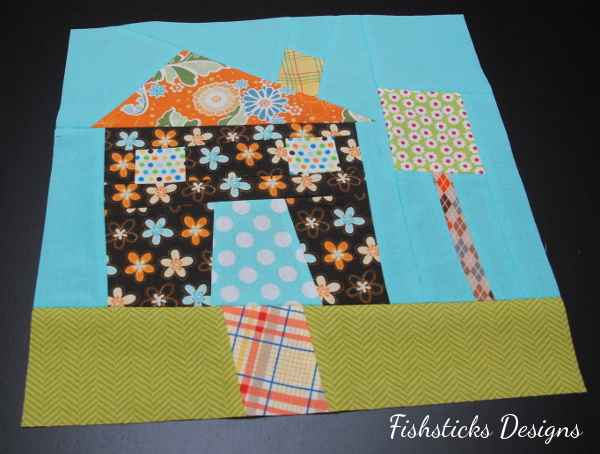 This is a simple and quick project that is as pretty as it is practical! 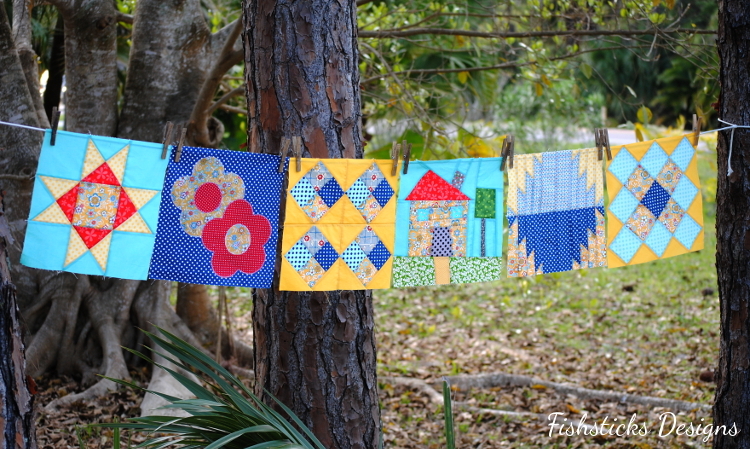 It’s a great way to showcase a favorite piece of fabric, and you can make it any size you like. 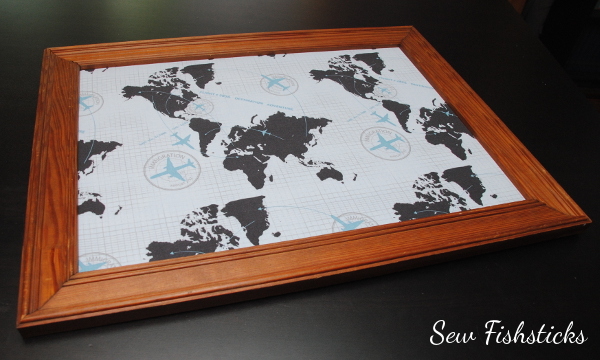 To see the one above in our newly re-decorated boys’ room, just click right here: All Around the World Boys’ Room. picture hangers (I used D-ring hangers on ours.) 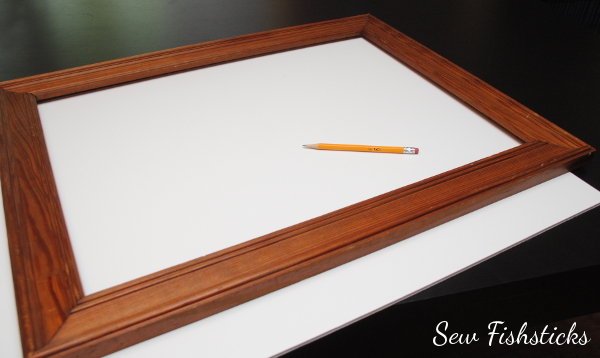 Slide your empty frame over the piece of foam board and shove the foam board tightly into one corner. One top and one side should be firmly up against the frame opening. 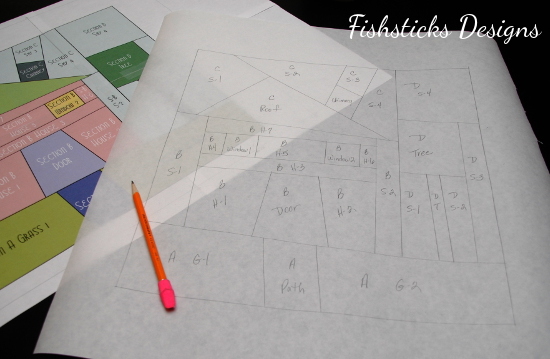 Use a pencil to trace the other side and the bottom onto the the foam board. You’ll have to slide the pencil tip up under the edge of the frame opening and angle it slightly. 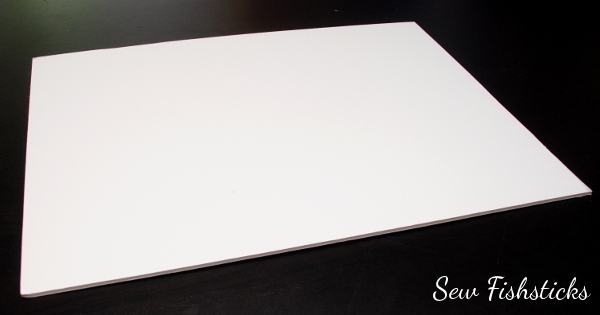 You want the foam board to fit tightly into the frame so be sure to trace right up against the opening. 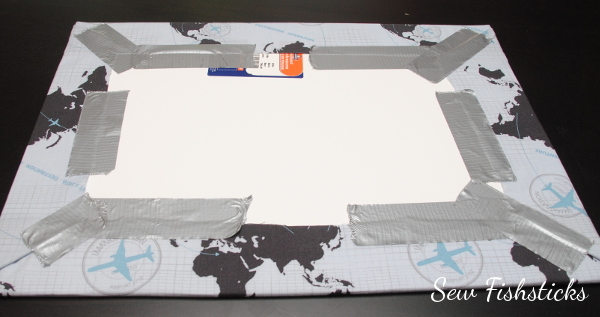 Remove the frame and use a craft knife and straight edge to cut the foam board along the lines you traced. Once your foam board is cut, check the fit inside the back of the frame before moving on. The foam board should fit snugly inside the frame. 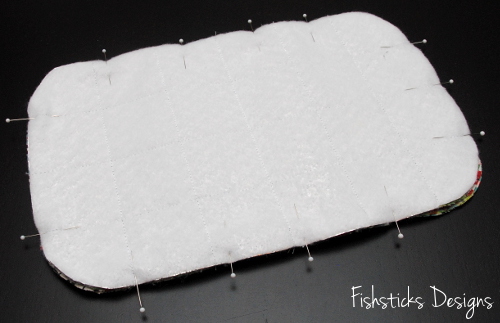 Trim your fabric so that you have at least a few inches to fold up and over on each side of your foam board piece. 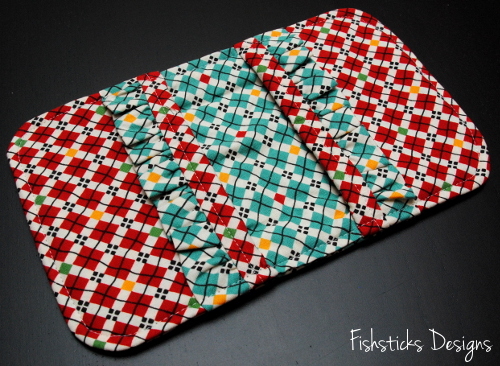 Spread your fabric out in front of you with the wrong side up. Center the cut piece of foam board on top of the fabric. 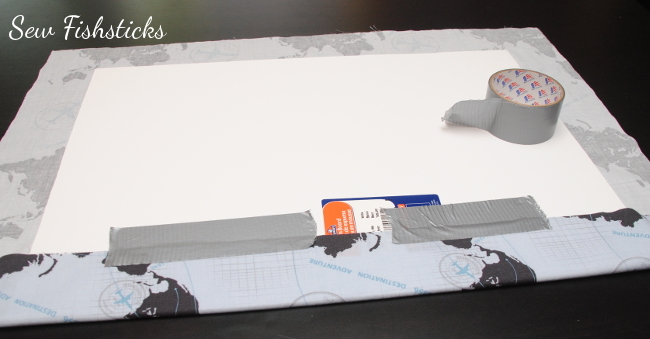 Wrap one long edge up over the foam board and duct tape it in place. (I know it seems silly to use duct tape, but it works! 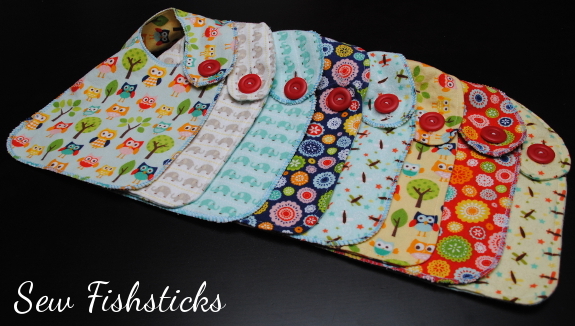 And, it allows you to easily switch out the fabric whenever you’d like.) Wrap the other long edge up and tape it, too. Wrap the short ends up just like you would wrap a gift and tape them in place, as well. Make sure that your fabric is taped securely. 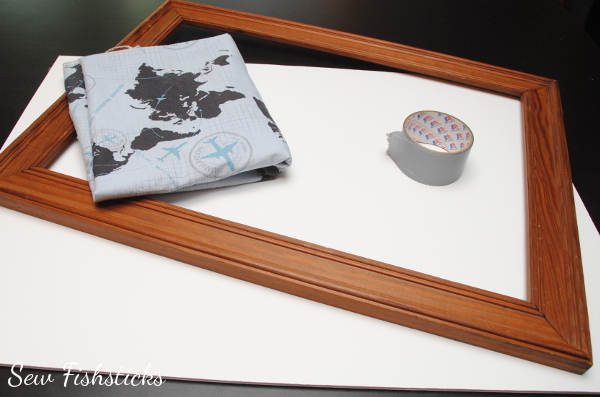 Press the fabric-wrapped foam board into the back of the frame. Attach hangers. Hang it up on the wall and display your treasures! Do note that if you pin and unpin things on this board often, you may have to replace the foam board since the holes don’t self-heal. 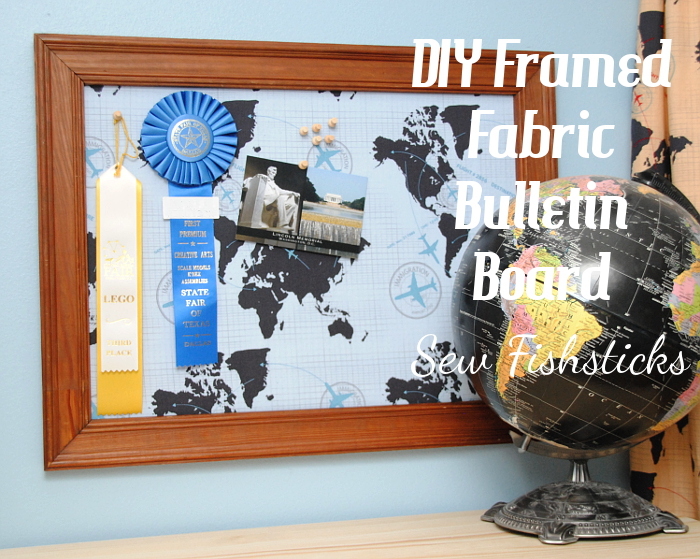 These bulletin boards have worked really well in our home, though, and I love how easy they are to switch out whenever the urge strikes! 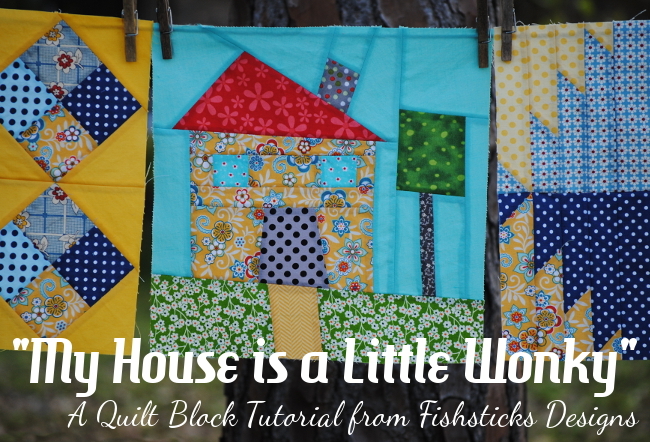 Welcome to the Fishsticks Designs Blog’s first quilt block tutorial! 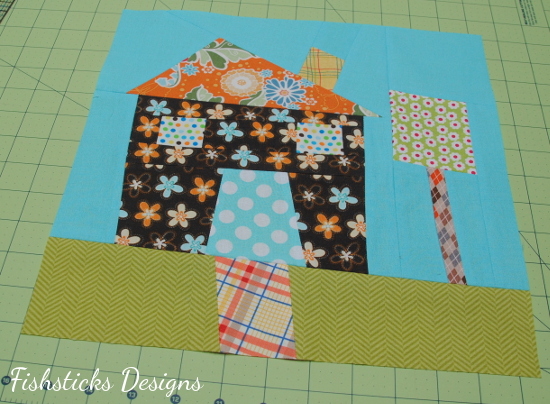 I am so excited about getting to be a part of the Around the Block Round Robin at Patchwork Posse! When Becky asked me if I’d like to join in by sharing my favorite quilt block, I knew right away what block that would be. 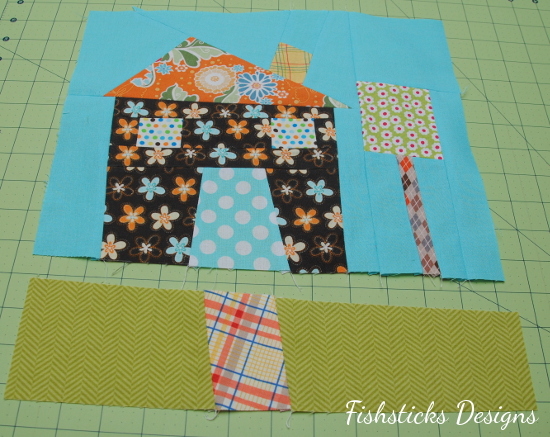 I’m calling it the “My House is a Little Wonky” Block. I love the whimsical nature of wonky house blocks, and the fact that they’re perfect in their imperfection. 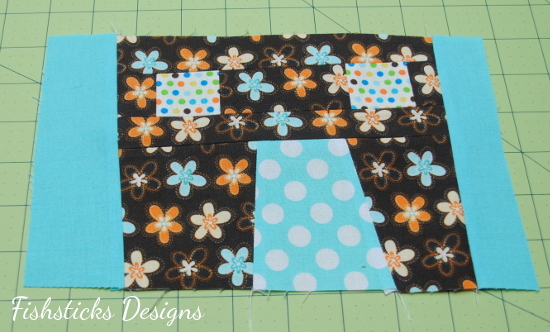 This block has no picky corners to be aligned perfectly, and it lets you use your imagination a bit. My husband retired from the Air Force about eight years ago after 20 (“and a half!” he would add) years, and we’ve lived in a lot of houses. With each move, I immediately started decorating to turn our house into our home. One of the things all of that decorating taught me, is that no house is ever perfectly straight . . . ever. It’s not really visible from the outside or with a casual glance, sometimes you even have to climb up into those dark corners to find out that the walls are slightly crooked, but they always are. I think there’s a little life lesson in that. In spite of how we might look from the outside or at a casual glance, we’re all a little wonky, just like our houses. It’s a good thing, too. If we weren’t, life would be far too boring! Ready to get started? 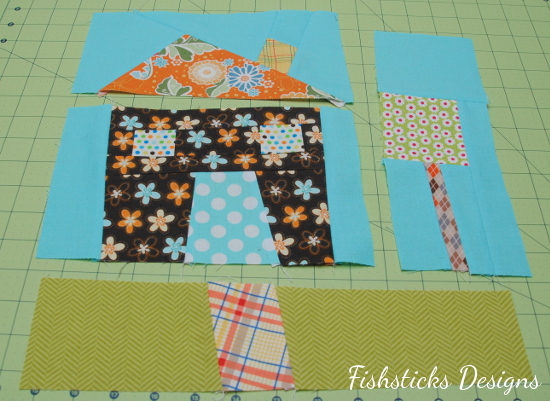 The tutorial for this freezer-paper-pieced block looks really long, but I promise this block is not hard to assemble at all. I’ll walk you through every step! You’ll need a few things before you get started. First, you’ll want to print this color template for your house block: Color Template. Be sure when you print that you’ve chosen to print at full-size or 100%. You may have to save the file to your computer to print it. (There’s a black and white template shown below, too. Don’t worry about printing it right now, but you may need it later: Black & White Template.) 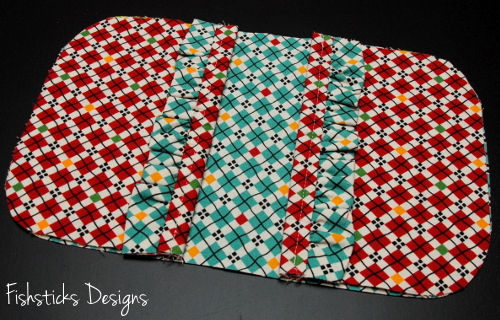 In addition to your regular quilting supplies, since this is a freezer-paper-pieced block, you’ll need some freezer paper. (Iron Man is totally optional, however. When you live in a house with little boys, and you walk away from your supplies, you often come back to find tiny visitors.) 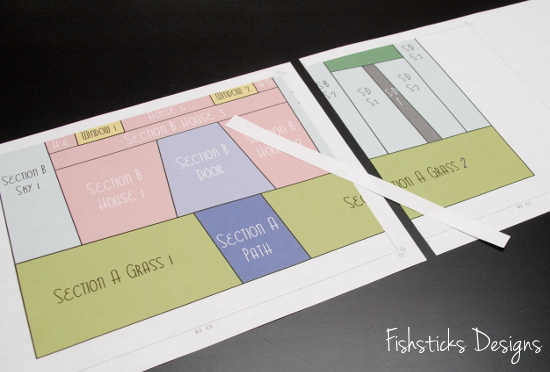 To assemble your color template, just trim the 1/2″ margin off of the left hand side of the bottom right corner page. Overlap the bottom right corner page with the bottom left corner page. Line everything up and tape it in place. Piece the top two pages together in the same manner, and then tape all four pieces together. 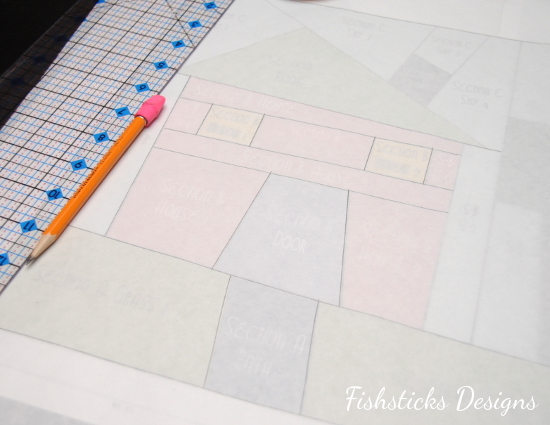 Check to make sure that your template measures 12 1/2″ square before moving on. Cut a piece of freezer paper slightly bigger than your template and place it shiny side down/matte side up on top of your template. 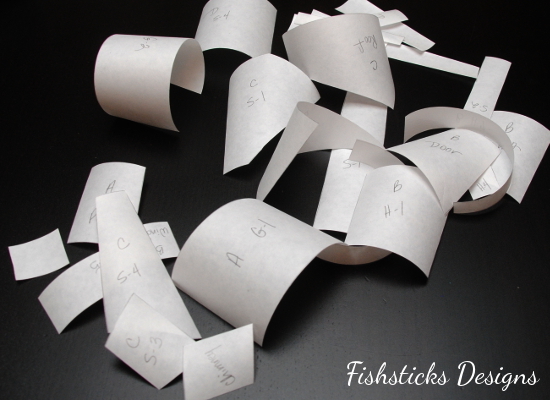 (If you find that it’s too difficult to see through the freezer paper, you can print the black and white template for tracing instead.) 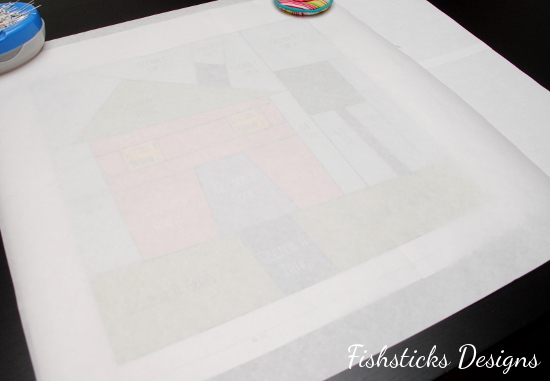 Using a pencil and straight edge, trace the template onto the matte side of the freezer paper. 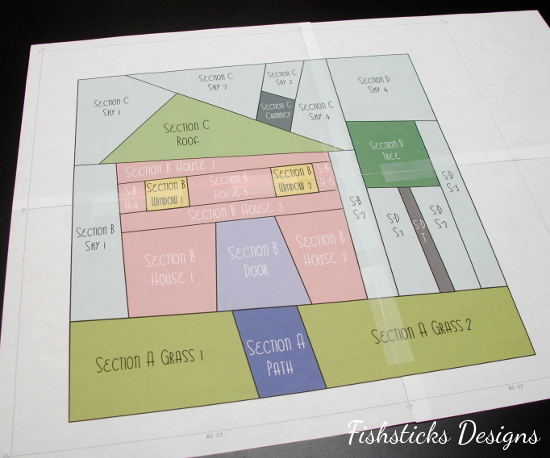 Use the color template to label all of the pieces. You’ll see that the block is divided into four sections, and the colors are labeled from left to right and from the bottom up. Using abbreviations will help this part to go faster. Choose your fabrics! 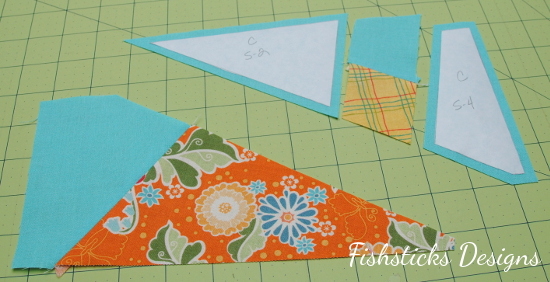 This is a great time to use up tiny scraps. They are perfect for windows, doors, chimney, etc. 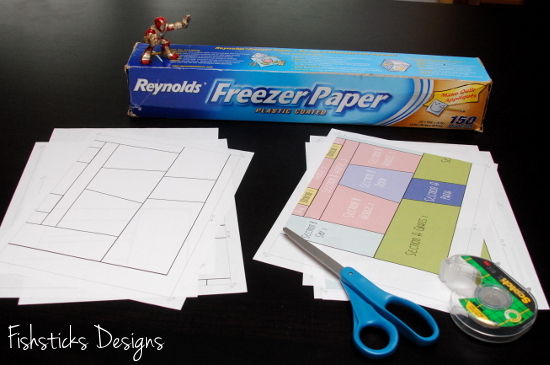 Cut your freezer paper template into pieces. 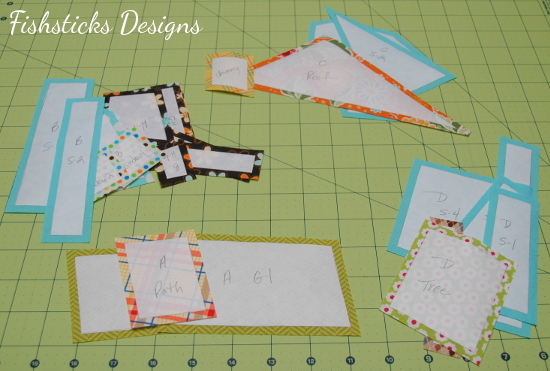 Separate the template pieces into colors/fabrics. Now the fun part starts! 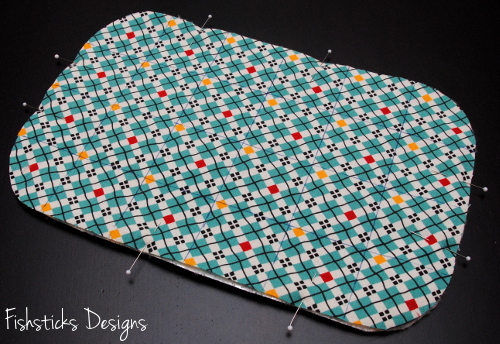 Position one of your template pieces on the fabric you’ve chosen for it with at least 1/4″ margin all the way around. 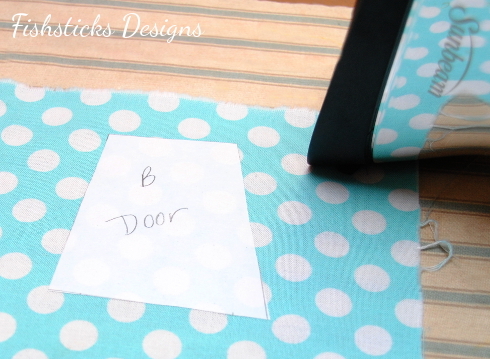 Be sure that you’ve placed the template on the right side of the fabric with the shiny side of the freezer paper down. 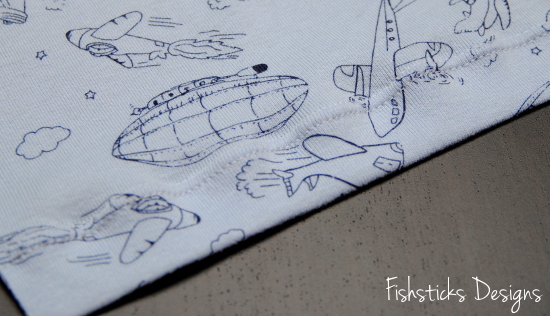 With your iron set to cotton/no steam, press the template onto the fabric. 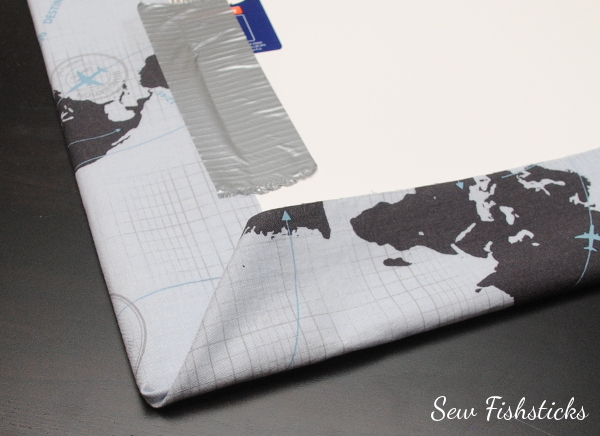 The coating on the shiny of the freezer paper will melt and the template will temporarily stick to the fabric. 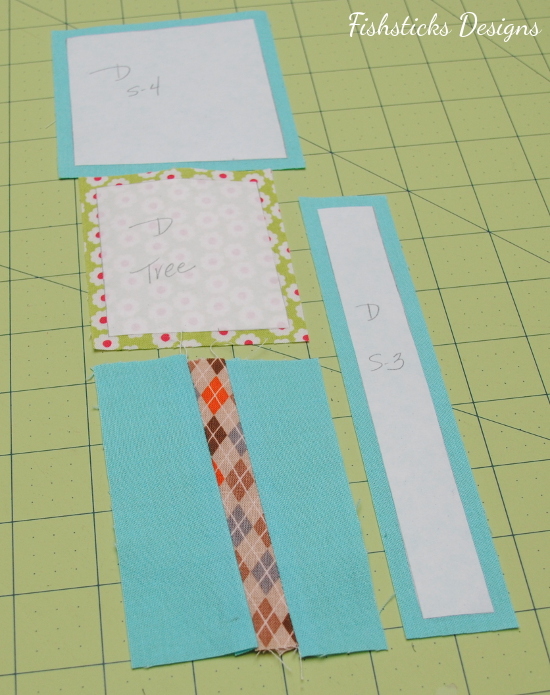 To add your 1/4″ seam allowance, place your clear quilting ruler on top of your template/fabric piece. 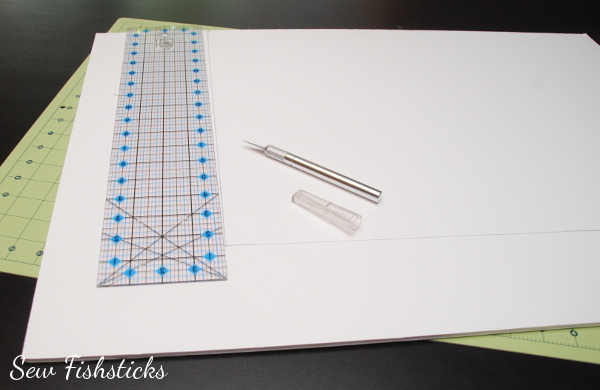 Line the 1/4″ marking up with the edge of the template so that the ruler overlaps the template, as shown. 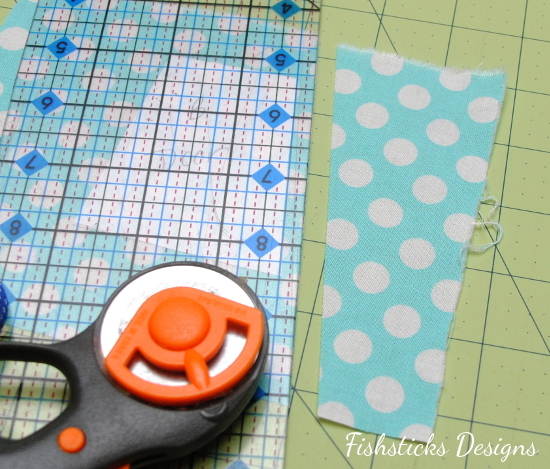 Run your rotary cutter down the edge of the ruler to trim away the excess fabric, leaving the 1/4″ seam allowance outside the template. 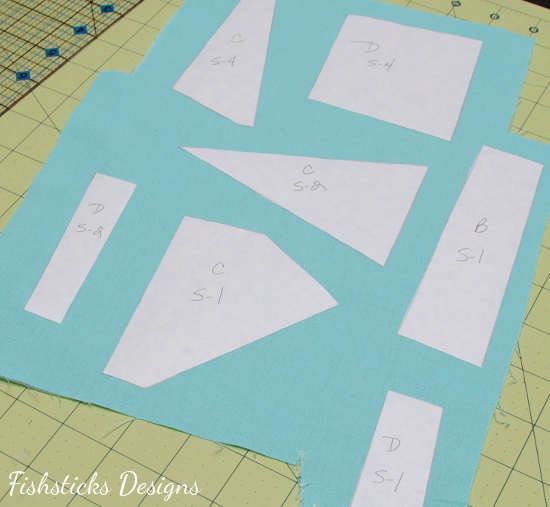 Cut each side of your fabric in the same manner so that you have a finished fabric piece with the template still attached and a 1/4″ seam allowance all the way around it. (Don’t take your templates off yet!) 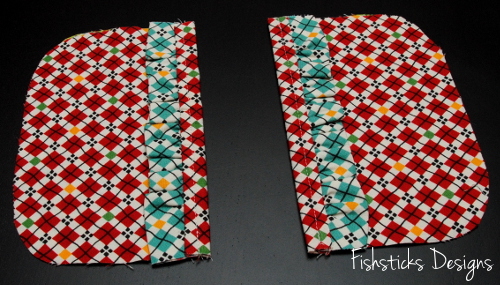 Where you have multiple templates for one piece of fabric, you can iron them all on at once, but be very careful to make sure you have 1/2″ (1/4″ times two) between all of the pieces. It’s best to put more than that, just in case. 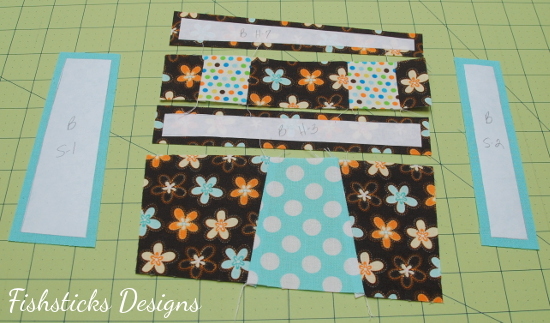 Continue ironing your templates onto your fabric and using your ruler and rotary cutter to trim away the excess fabric leaving 1/4″ seam allowance all the way around each template. Once you’re finished, separate them all into their individual sections. The remaining pictures will walk you through the order in which to assemble your pieces. Remove the templates as you get to each piece. 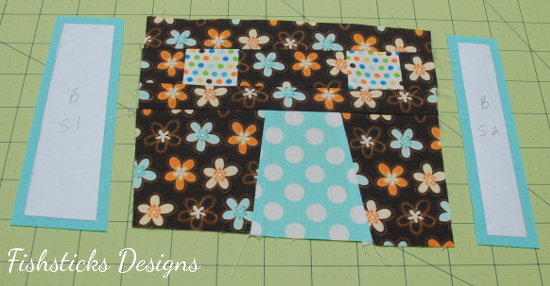 Stitch the pieces together using 1/4″ seam allowance and press your seams (open or to one side, whichever you prefer) before moving on to the next fabric piece. 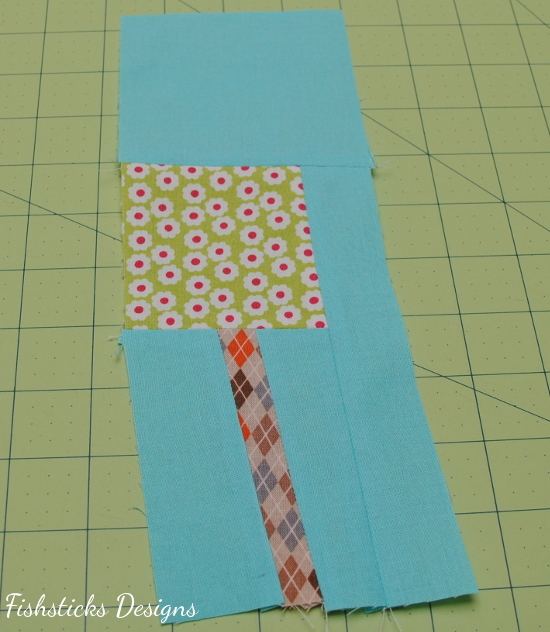 Start by sewing the Section 1 grass pieces to either side of the path. Assemble Section 2 next — the house, including doors and windows. Move onto Section 3 which includes the roof, chimney and sky pieces. 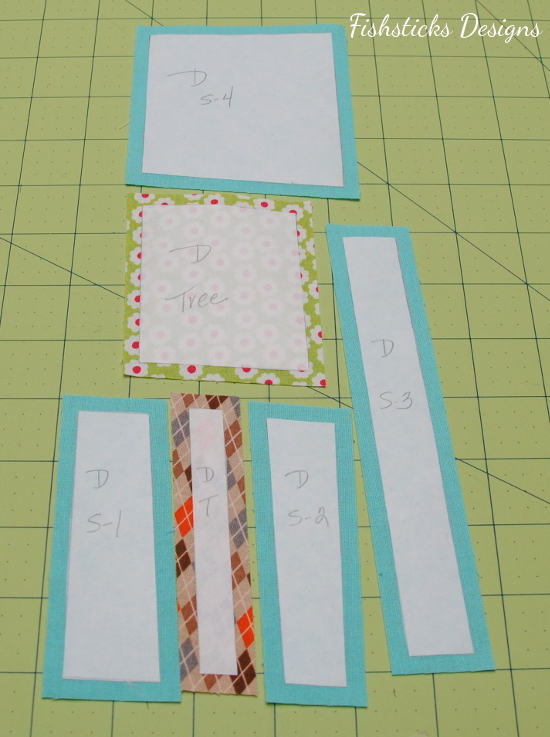 Finally, sew the Section 4 tree pieces together. 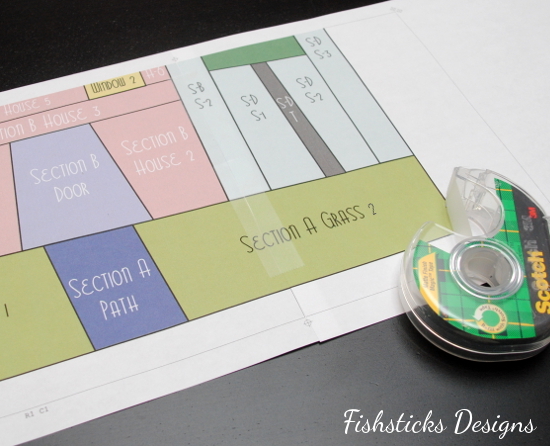 Now you’re ready to sew your sections together! Almost done! 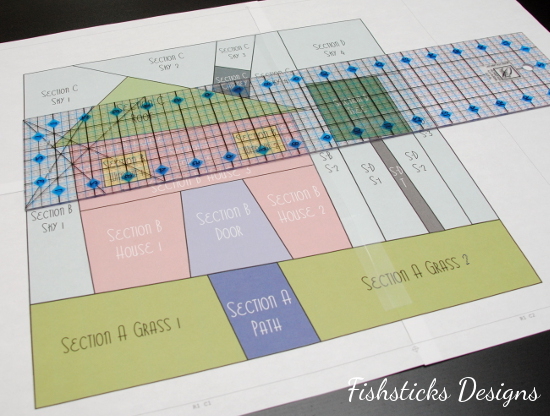 Just square your block up to 12 1/2″ and admire your work. That wasn’t hard at all, right? I can’t wait to see your finished blocks! I’ve been having such a great time sewing along myself. Want to see my blocks so far? I love how they’re coming together! The Updated FREE Tank & The Red Carpet Awards! I’m nearly bubbling over with excitement here! I have several new things to share with you over the next week or so, and I can’t wait to hear what you think about each of them! 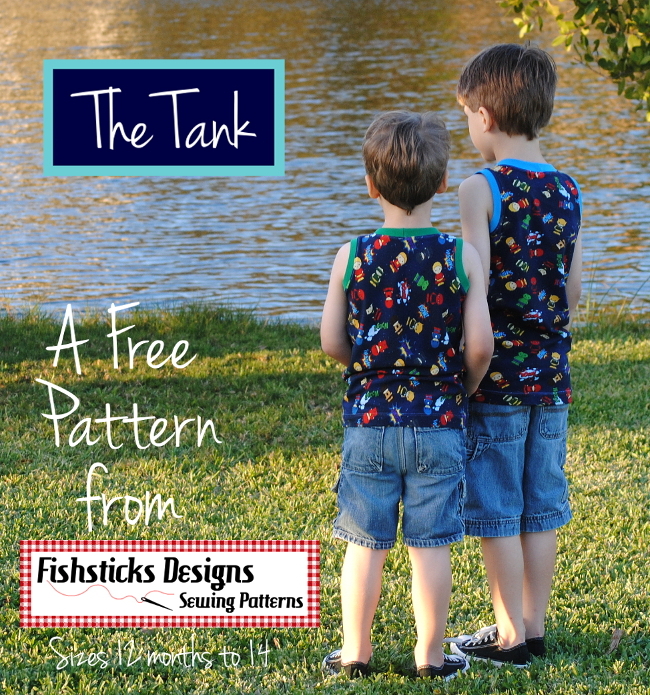 Today brings the first announcement: the re-release of the FREE Fishsticks Designs The Tank pattern (now in sizes 12 months to 14)! 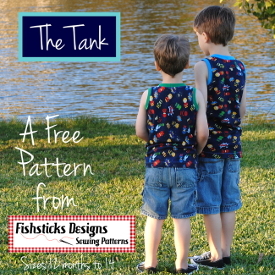 I’ve done quite a bit of work in revising my free The Tank pattern, adding big kid sizes and incorporating a big change that is coming soon to all of my PDF patterns. (You’re going to love it!) The Tank pattern is designed to be sewn with cotton and cotton blend knits — jersey, interlock or ribbed knits in the body and interlock or ribbing for the neckband and armholes. The fit is narrower and longer than a standard tee, making it great for layering, but still perfect for wearing on its own. It also makes a great PJ top when paired with woven or knit lounge pants. 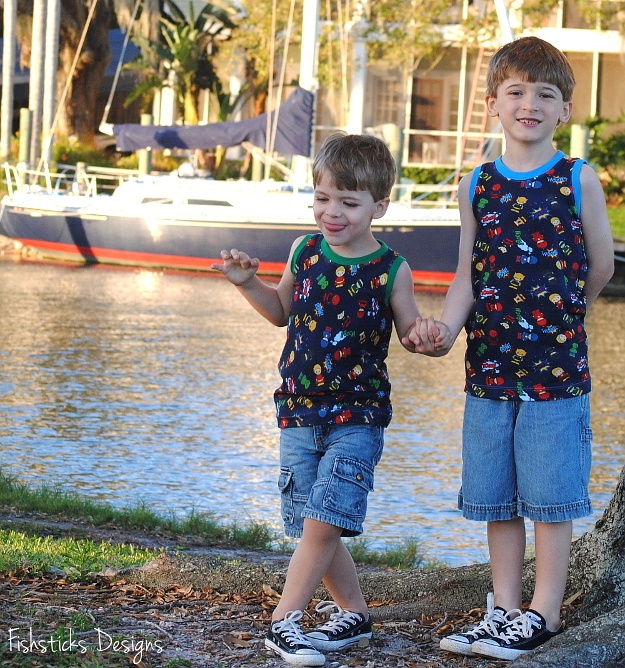 (If you haven’t already, be sure to check out the appliqued tanks that I made for my seven-year-old last month!) 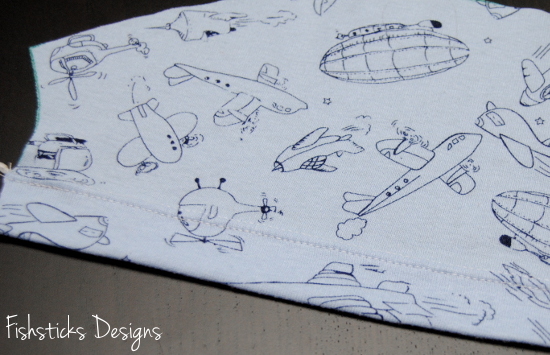 Or, you can match it up with Undercover Bottoms Boxer Briefs for the perfect little boys’ undies set. 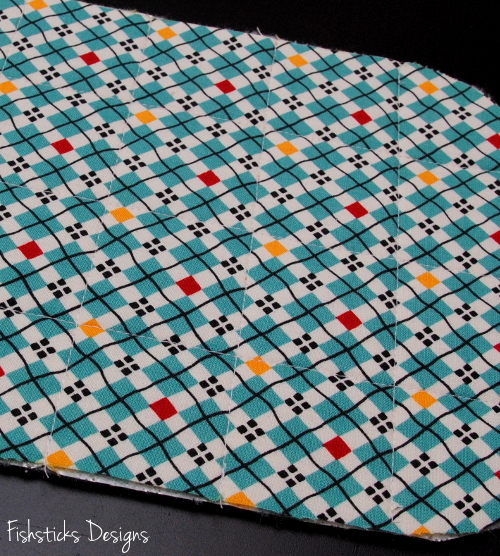 A little aside from the pattern itself, isn’t that the cutest fabric? My boys LOVE it! It came from a custom fabric group that you can find right here: Fabric Stache. If you’re looking for great knits with prints that you can’t find just anywhere, go visit! 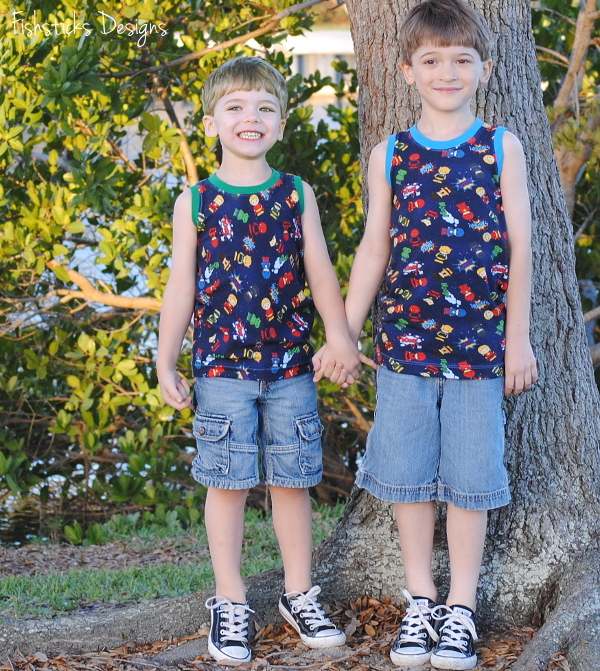 (They’re doing sew-alongs every other week right now with my knit patterns, too.) 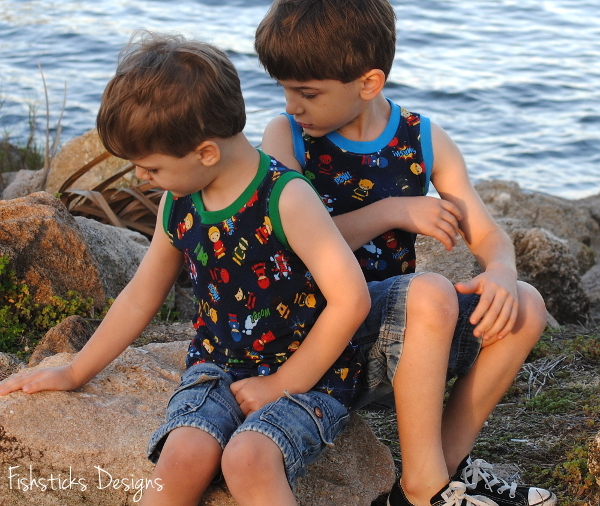 Back to the subject at hand, to download the pattern, just click right here: The Tank Pattern. 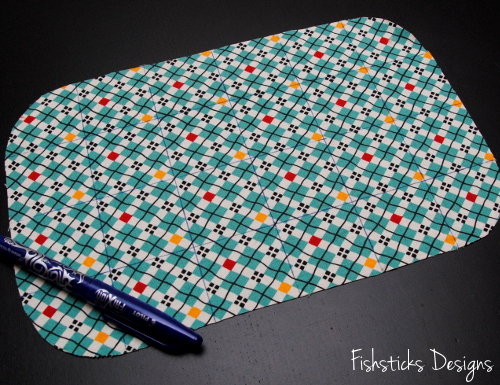 I’ll be back tomorrow with my next announcement, but if you’re already familiar with my PDF patterns, you’ll figure it out really quickly by scrolling through The Tank pattern! I just have one, no, two last pictures to share before I wrap up this post. Because we live in Florida, tanks work well for us almost year-round. 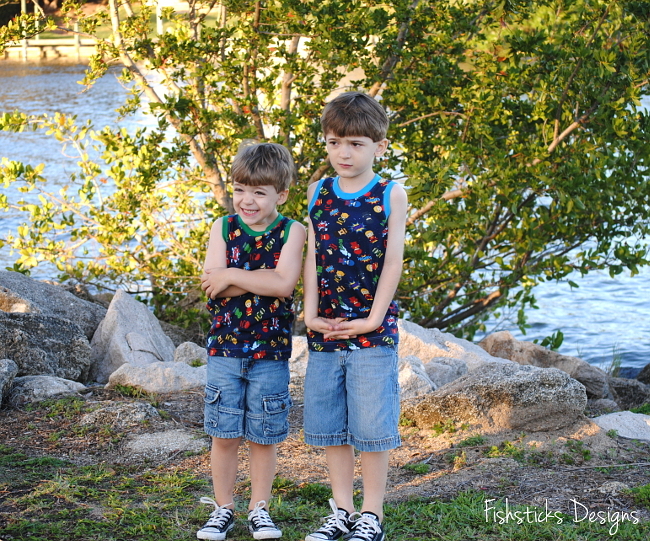 My little Florida babies, though, thought that they were going to freeze to death when I dragged them out to take pictures last week . . . in 65 degree weather! The “freezing cold” weather, however, did not stop them from insisting that I follow through with the promise of frozen yogurt after our photo session! 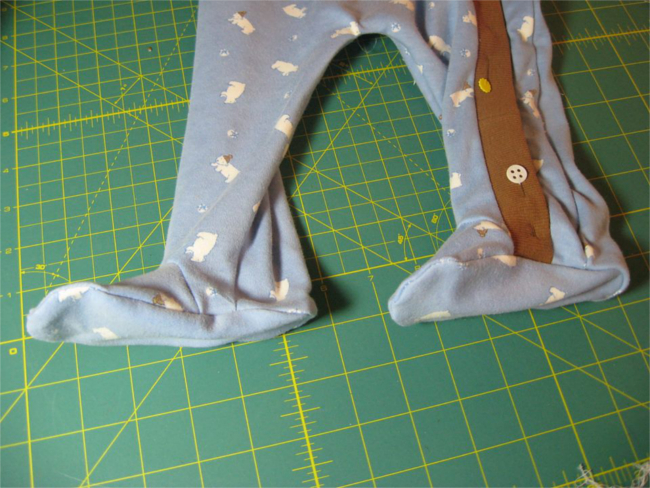 My friend, Allison, from Alternate Endings put together this simple tutorial for adding feet to the Jamie Jumper, and I asked her if she’d mind letting me share it on my blog. 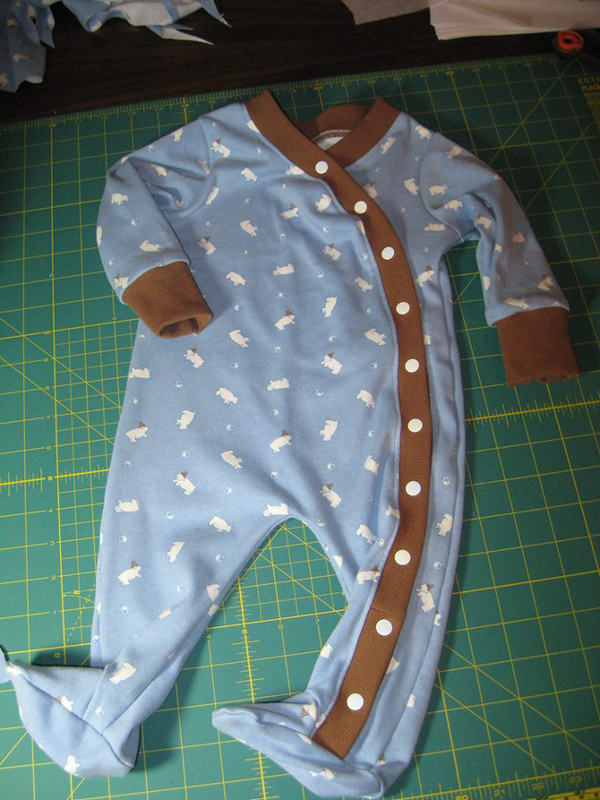 If you’re looking to make footie PJs for your little ones this winter, just grab your Little One Layette or Wee Tot Collection pattern, and check this out! 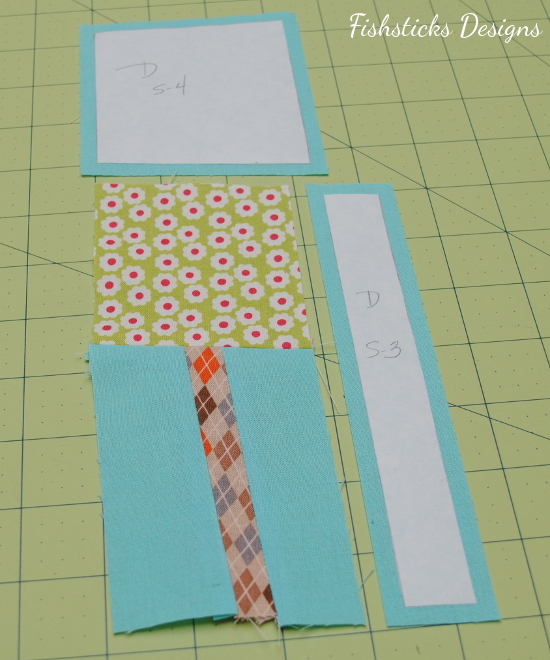 Begin by laying out your pattern pieces (except for leg cuffs – you won’t need them) as directed in the instructions, adding 2″ to the bottom of each leg section. 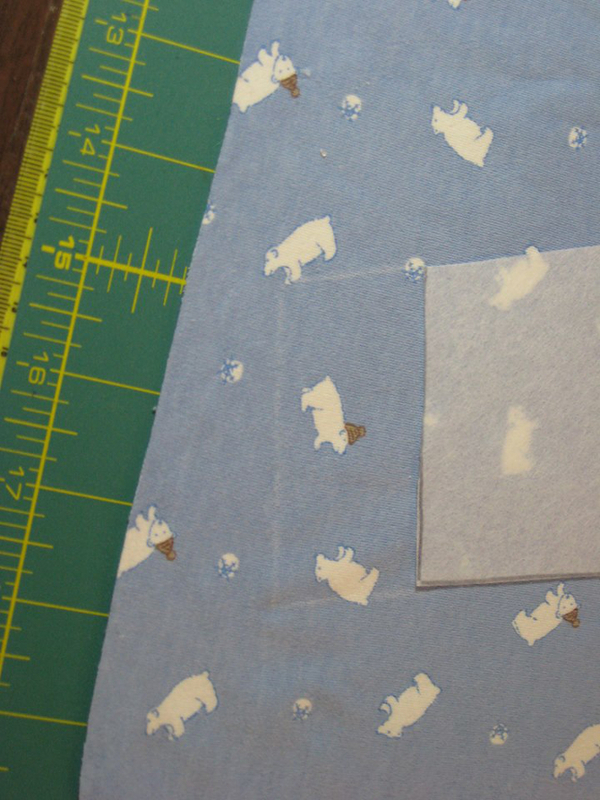 Also add at least 2-3 inches to each piece of binding. If it’s too long you can cut off the excess. You will also need to cut out pieces for the feet. 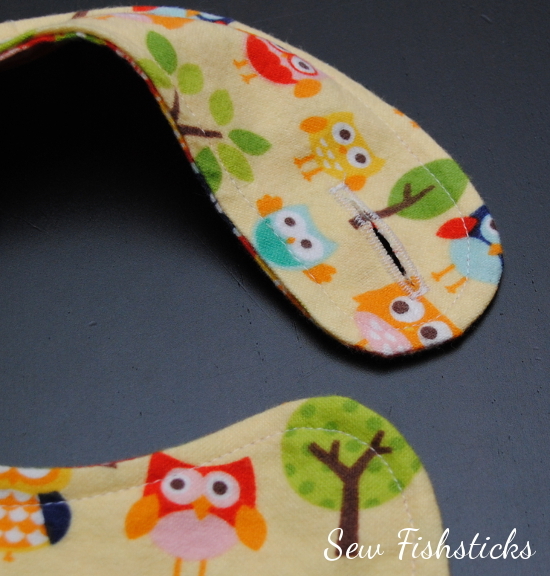 I used pattern pieces from a different pattern, but you can also use the bottom and top pieces for a soft-sole shoe pattern, or just trace around your child’s foot with these approximate shapes, being sure to give some wiggle room and adding a 1/2″ seam allowance. (The half piece is for the top of the foot, and the whole piece is the sole.) If it fits your baby, it should work just fine. Assemble your Jamie Jumper as usual, leaving off the leg cuffs. And don’t forget to make a few mistakes like I did. You know, things like forgetting to cut the binding an extra two inches longer and having to move the serger next to the sewing machine so you can sew an extra strip of binding on without having to remove the garment from the serger. Please make that mistake. It will make me feel so much better. After the JJ is assembled, you need to cut a rounded “V” shape onto the bottom front of each leg – approximately 1″ wide and 1-1/4″ high. Round the pointed part a bit. When you make the V for the side with the ribbing/binding, be careful not to cut it too close to the ribbing. 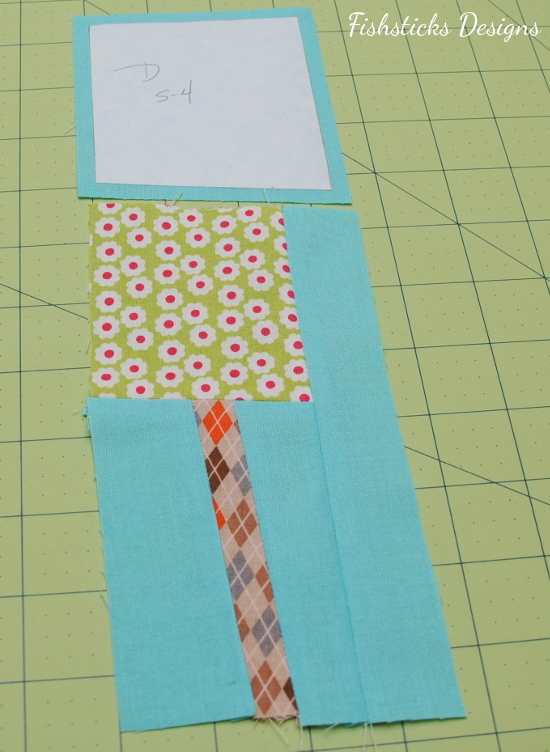 Leave about 1/4″ between the ribbing and the V so you have room to attach the foot pieces. 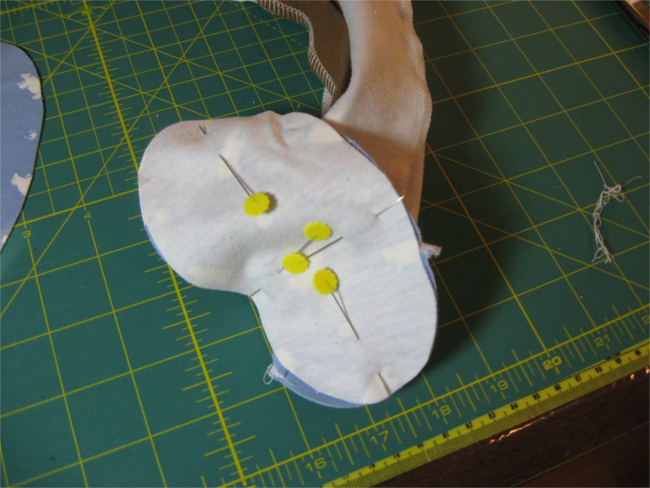 Attach the top part of the footie to each “V”, right sides together. Match the middles and sides. You will probably have to stretch the V a little to make it fit. 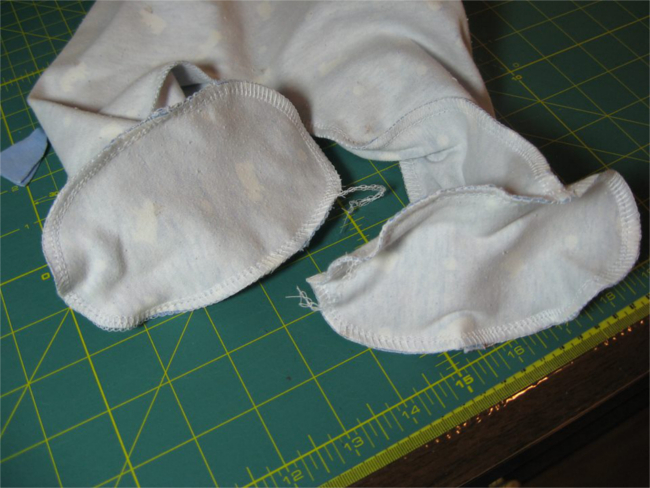 After you have attached the top portion of the footie, turn your JJ inside out and attach the bottom part of the footie to the bottom of the Jumper, right sides together. Match ends and sides. You will probably not need to stretch anything for this to fit – unless you have a very large-footed kid. Turn garment right side out, admire your handiwork, and finish jumper as directed. Tutorial by Allison Sanders Morton. 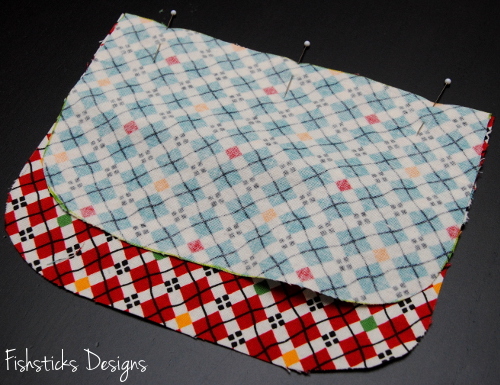 I originally shared this information as part of the Charlie Tee Sew-along in July of 2013, but I thought it deserved to be turned into a stand-alone tutorial so that it’s easy for you to refer to when necessary. 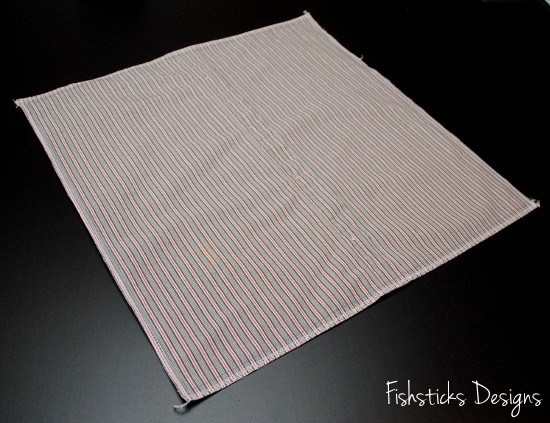 The twin needle is a perfect choice for hemming knits, not only because it gives your sewing a beautiful finished look, but also because it gives you two rows of stitches on the front (see above), and a nice stretchy zig-zag on the back (see below). That stretch in the twin needle hem goes a long way in helping to prevent popped stitches. Let’s get started! 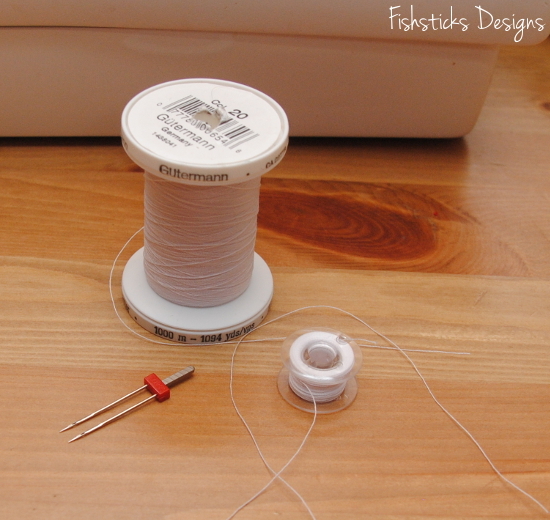 First you need a few tools: a twin needle (also referred to as a double needle), your regular spool of thread and a second source of thread (I use a bobbin). 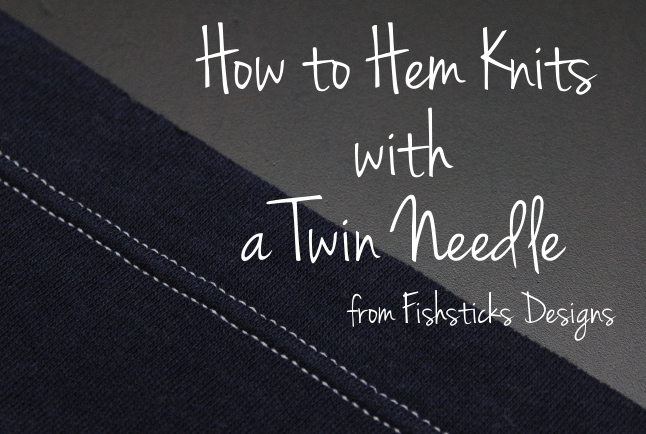 Since you’re working with knits, it’s best to use a ballpoint or stretch twin needle. Those are hard to find locally, but they are pretty easy to find online: stretch twin needle, ballpoint twin needle. I prefer the 4.0 mm twin needle — that number refers to the measurement between the left and right needles. You can use a 2.5 mm if you’d like your stitches closer together. 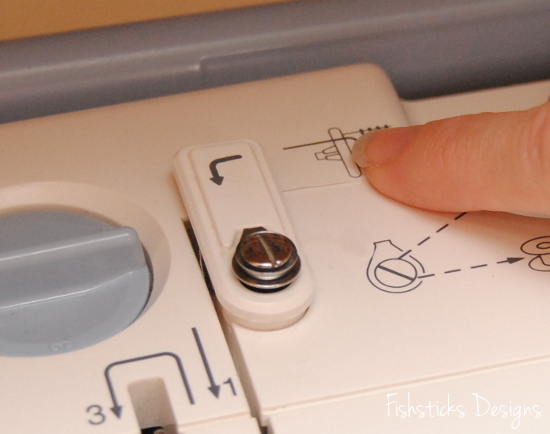 Some sewing machines, like mine, have a button or switch that needs to be pushed to change from single to double-needle sewing. Here’s what that button looks like on my machine. Go ahead and press that button. 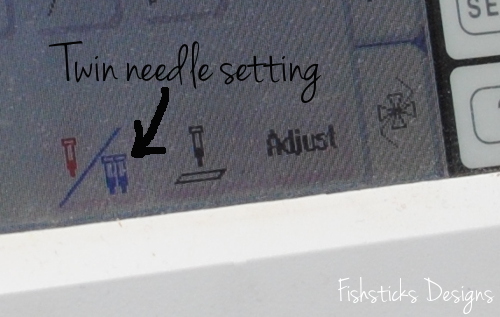 Remove your single needle and replace it with the twin needle. 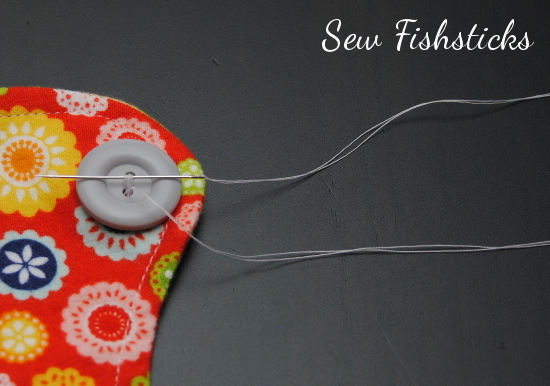 Many sewists put both thread sources on the pin that holds your regular spool. On my machine the threads tend to tangle when I do it this way. 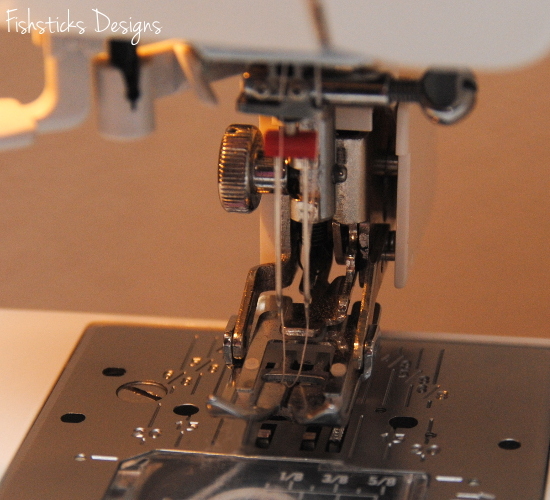 Some machines have a extra removeable pin just for a second spool of thread. I think mine did at one time, but I’m not sure where it’s disappeared to. It’s not a problem, though, since I’m using a bobbin for my second thread. 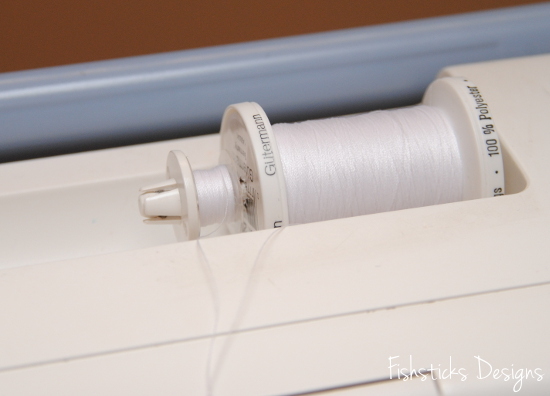 I just pop that bobbin onto the bobbin-winding pin with the thread feeding towards the front of the machine. You can thread the twin needle by pulling both threads through as one. My machine is a little bit picky, though, and I’ve had to work with it until I found the best way to thread the twin needle. What I do is thread the left needle first from the spool of thread, then I press and hold that thread in place on top of the machine just before it enters the guides while I thread the right needle from the bobbin. Once I have both needles threaded, I pull the threads back away from the machine as one. 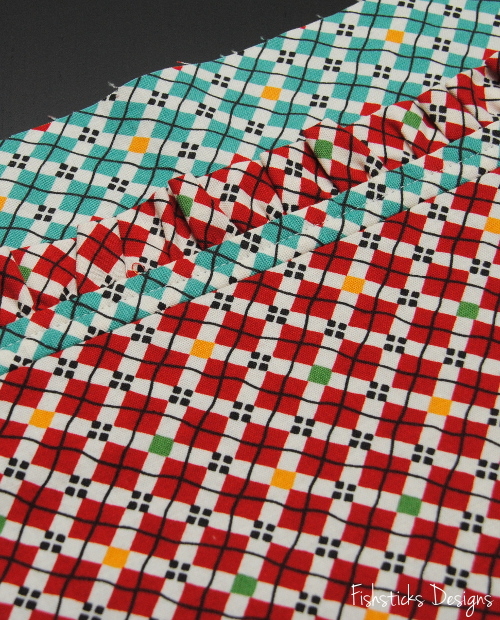 Now that your twin needle is threaded, we’re ready to get hemming! I serge the raw edges of my hems, but that is purely for aesthetic reasons. (I like for the inside of my garments to look as nice as the outside.) Because knits don’t fray, you can totally skip this step if you want to. With a hot steam iron, press your hem allowance to the inside. 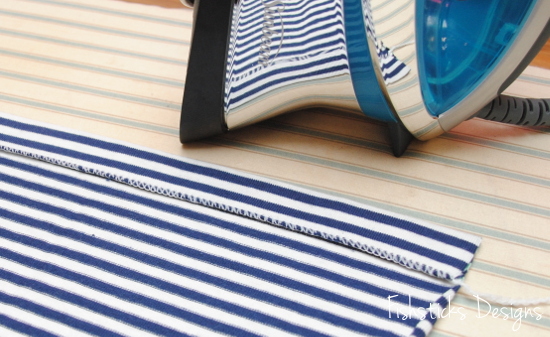 If your knit is particularly stretchy or uncooperative, use a little spray starch when you iron. 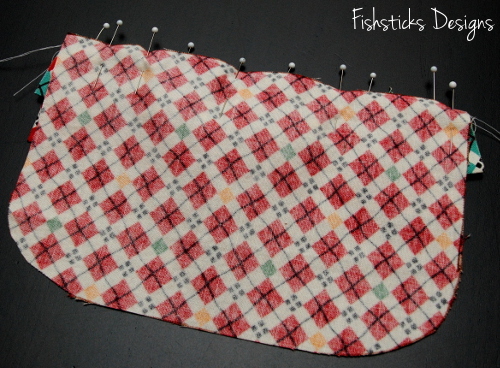 Because we’re going to be stitching on the right side of the fabric, and I don’t want to sew over my pins, I use long pins and position them so that the heads hang off of the folded edge. This way, I can make sure that the hem is pinned properly, and I can remove them as I get to them while I’m sewing. 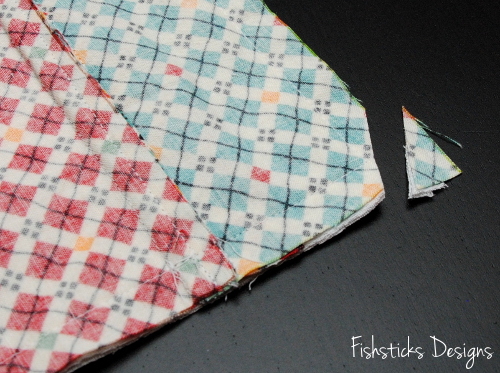 I like to start my hems about 1/2″ in from the edge of the fabric. 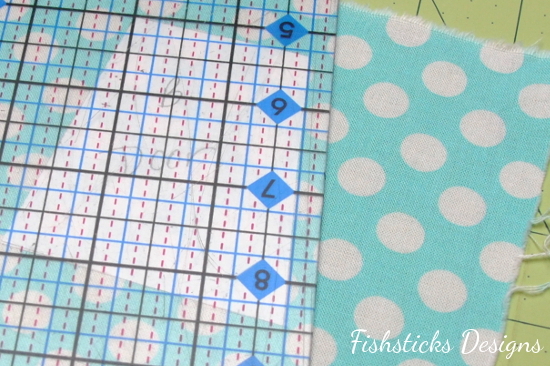 Set your stitch length to 3.0 or 3.5. 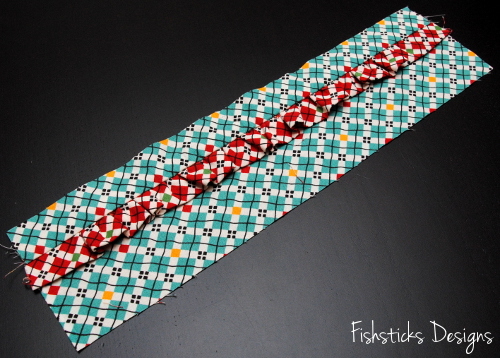 (Shorter stitch lengths stretch fabrics.) I backstitch about 1/4″, then stitch all the way across feeling through the fabrics to make sure that my stitching is falling just inside the raw edge on the underside of the fabric. 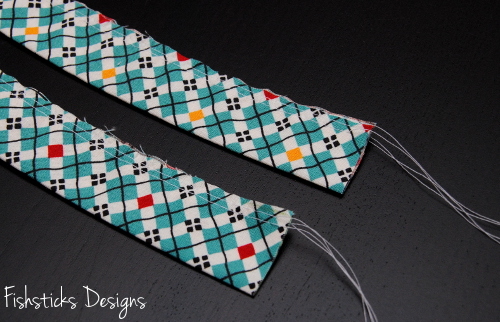 I stop stitching about 1/4″ from the opposite side, backstitch to 1/2″ then sew forward again to the end. (Starting your stitching a bit in from the edge will help to keep your machine from “eating” the end of your knit fabrics. 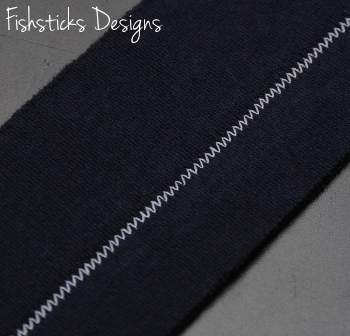 Backstitching to 1/2″ will help make sure that you don’t chop off your fastening stitches when you serge later.) 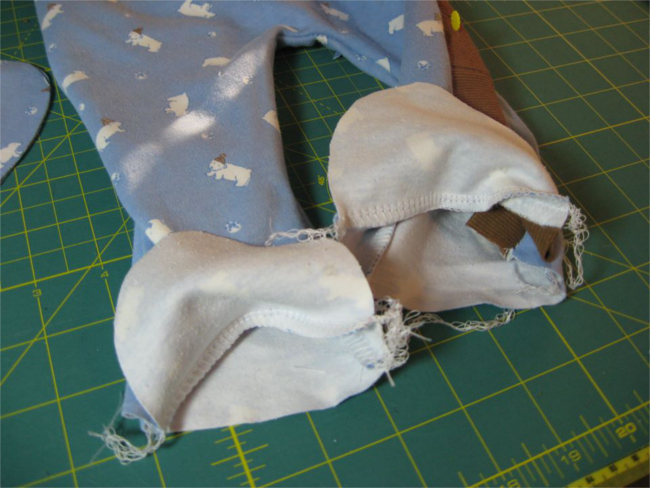 Be careful not to stretch or pull your fabrics as you’re sewing. Just guide and let the feed-dogs pull them through. (This is much easier with a walking foot!) Pulling on your fabrics while you’re sewing can lead to hems that look like this: What you really want, though, is hems that look like this: That wasn’t too hard was it? With Christmas less than two weeks away and my sewing barely begun, I needed a quick and simple project this past weekend to give our livingroom a little extra Christmas cheer. 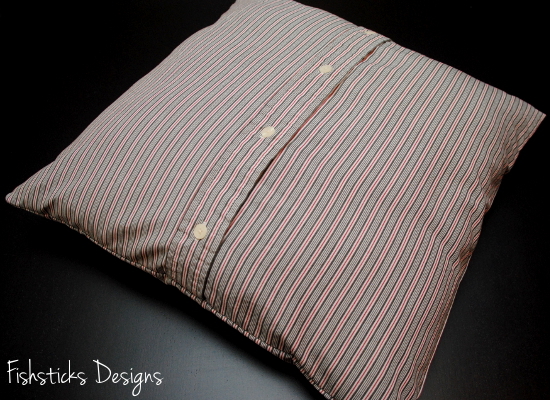 A few new toss pillow covers in Christmas red and green made from thrifted button-down shirts filled that need quite nicely! 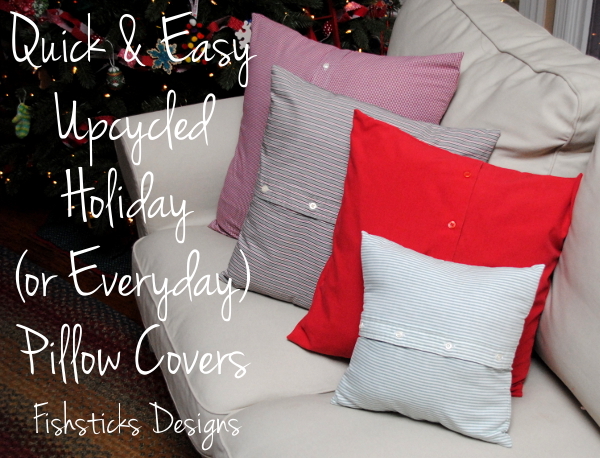 In colors to match your decor, these pillow covers would actually work as beautifully year-round as they do for the holidays. Want to make a few of your own? Just read on. 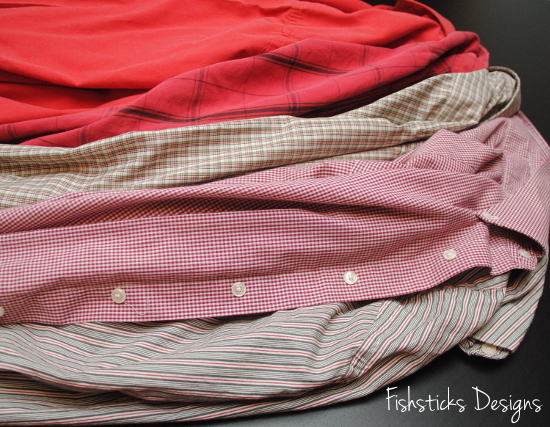 To get started, you need a pile of men’s button-down shirts. I found all of these at our local Goodwill store for around $2 a piece. For larger pillows, of course, you’ll need larger shirts. You also need toss pillows. I used the ones that were already on my sofa. 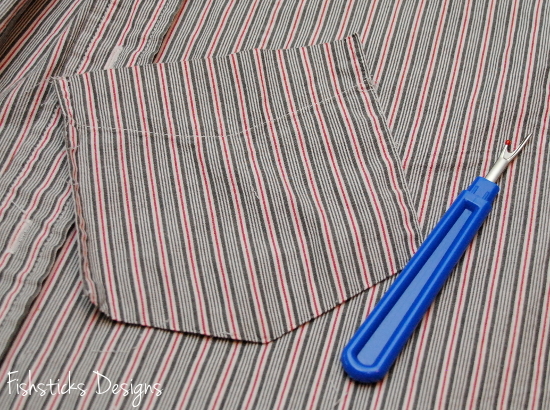 The first step is to remove the pocket from the shirt that you’re working with. Just grab your handy seam ripper and carefully rip it off. (If you cut the stitches on the pocket side rather than the shirt side, you run less risk of damaging the shirt.) Once the pocket is off, if you have tiny needle holes remaining, either spray them down with water from a spray bottle and press well with a hot steam iron, or place a damp cloth over the area with the holes and press well with your steam iron. Cut the front and back of the shirt apart. Measure your pillow. Mine measured 17″ square. Most shams are made to the exact size of the pillow, but since I like mine to be just a little bit snug, I’m going to make my sham 16 1/2″ square. 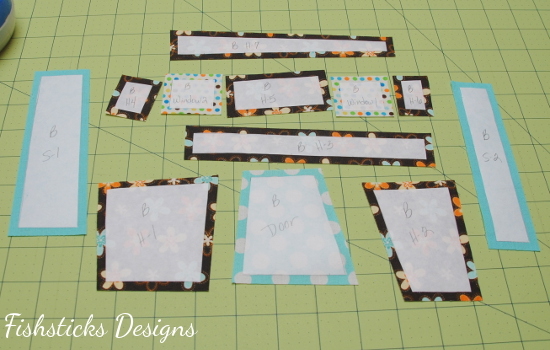 Because I’m using a 1/2″ seam allowance, I’ll add 1″ to that measurement (seam allowance times two), and cut my front and back pieces 17 1/2″ square. 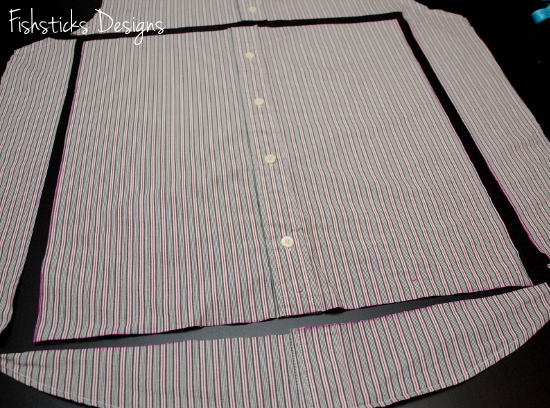 With the shirt front buttoned, measure and draw your piece. 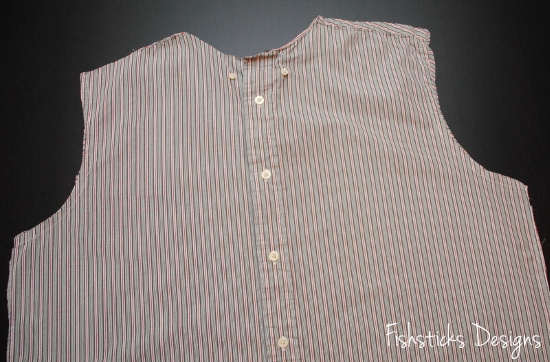 I centered my button placket, but you could place it off-center if your shirt is large enough. You will want to center the individual buttons, however. To do this, I just move my see-through ruler up and down until I have the correct full measurement and an even amount above the top button and below the bottom button. Be careful not to get the top and bottom buttons too close to your seam allowance. You want them to be at least 1 1/2″ in. 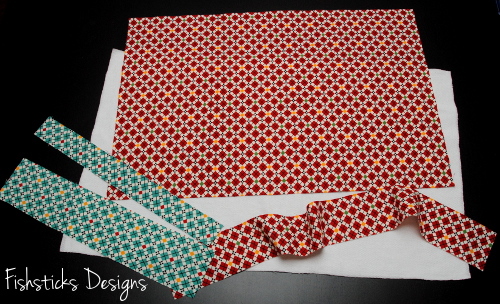 Cut a second piece from the back of the shirt for the back of your pillow sham. Pin the front and back pieces right sides together. Sew all the way around at 1/2″. I serged the edges after sewing, but since no one is likely to see inside these shams, you don’t really need to. Once the two pieces are sewn together, just reach through between two of the buttons and unbutton one to turn the sham right side out. Push the corners out neatly, unbutton the cover completely, slide your pillow in, button it back up and toss it on your couch!